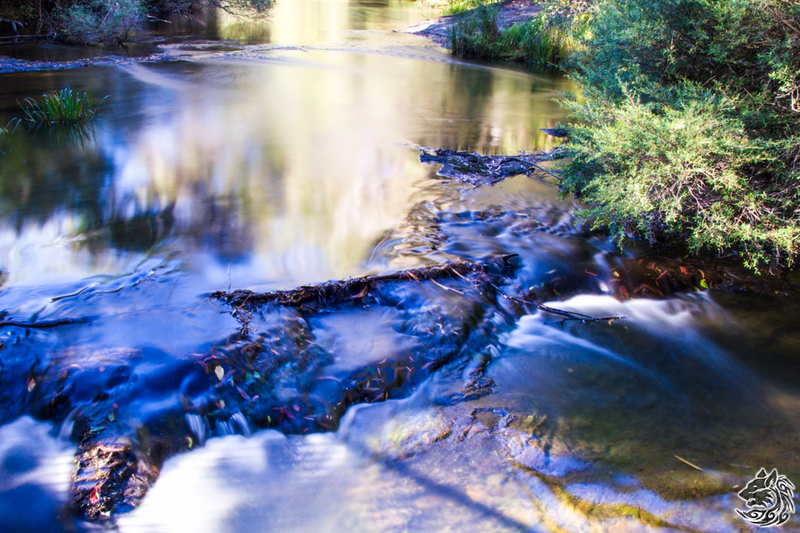 The Shoalhaven catchment takes in a wide swath of country covering some impressive coastal escarpments and deeply incised valleys. 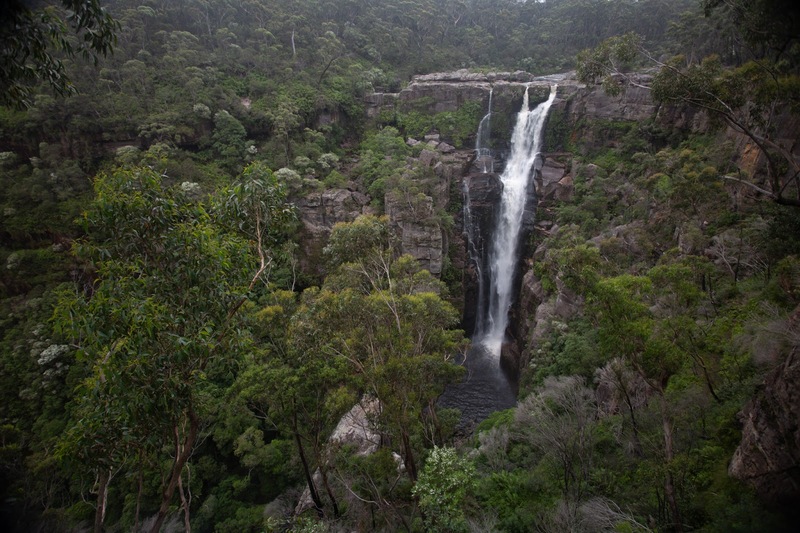 The Yarrunga Creek hosts nine high waterfalls, including the 81m Fitzroy Fall and the 75m Lady Hordern Falls. We do not know the First People names for the pools of these falls. 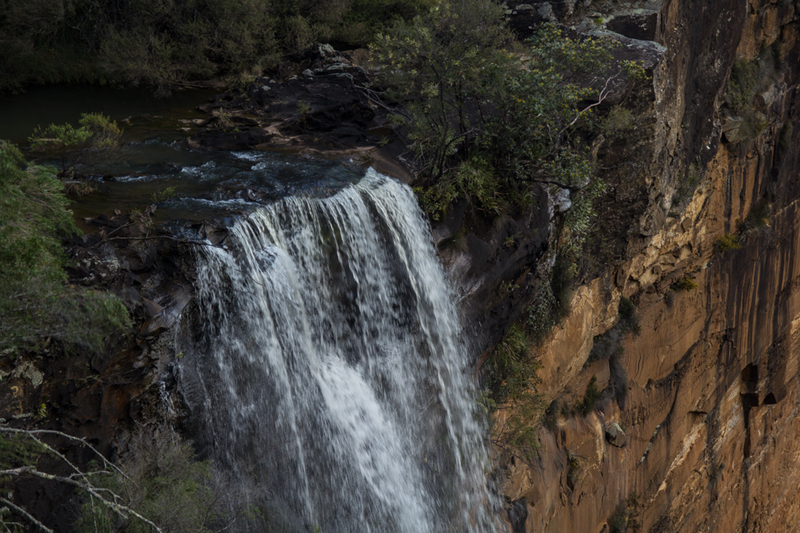 European settlers originally called the main fall ‘Throsby’s Waterfall’ to honor the explorer Charles Throsby. 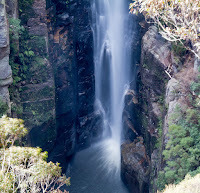 The fall was visited by the tragic Sir Charles Fitzroy, Governor of New South Wales (1846-51) in 1850. 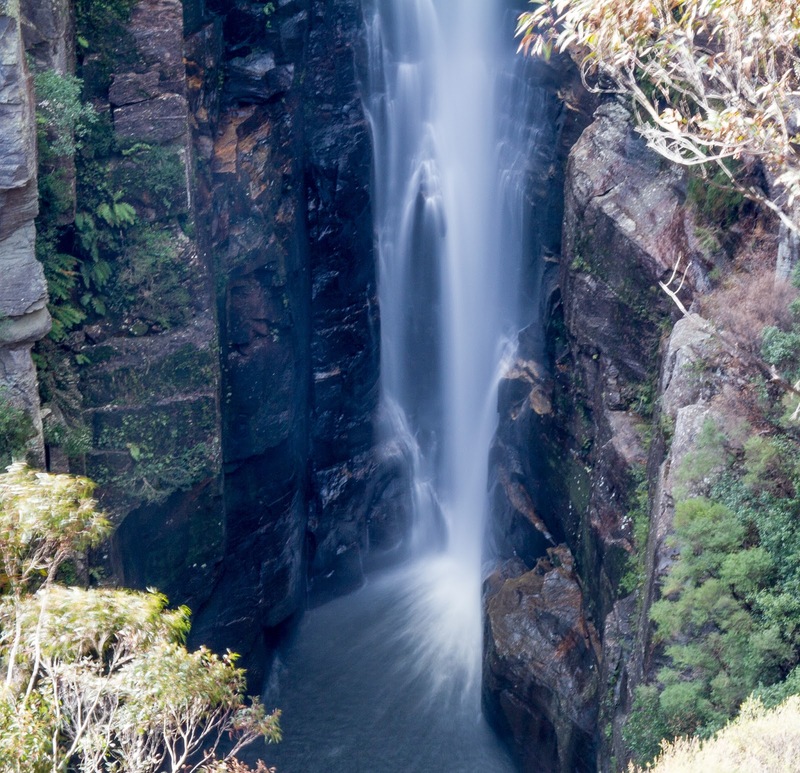 The main fall was renamed in his honor: the 10th Governor of New South Wales, brother of the captain of the Beagle, Robert Fitzroy. An interesting and tragic family. 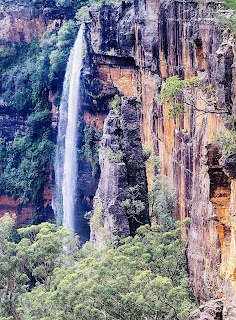 I have often followed in the footsteps of Robert's travelling companion, Charles Darwin as i travel the Blue Mountains, I often stand at Govett's Leap where he gazed into the abyss and instead saw immeasurable time unwind. 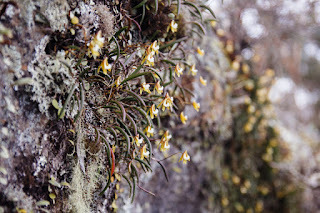 We have forgotten about Fitzroy (and his relative Robert Fitzroy (later Governor of New Zealand). Perhaps that name is a way of reminding us of the rough passage to independent statehood of many of the Australian States. Charles Fitzroy was the first ‘Governor-General’ of a number of Australian colonies. 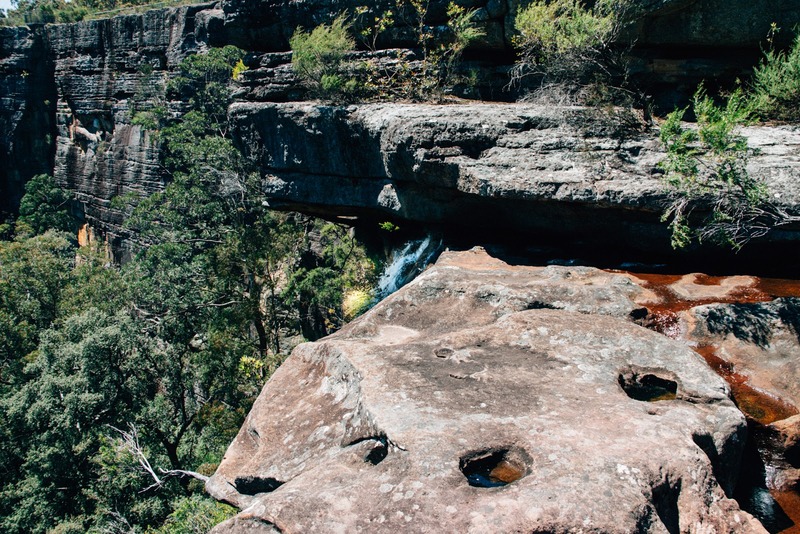 Tracks along the East and West Rims from Fitzroy Falls will take you along the escarpment to view points of the other falls, and eroded and orphaned cliff structures. 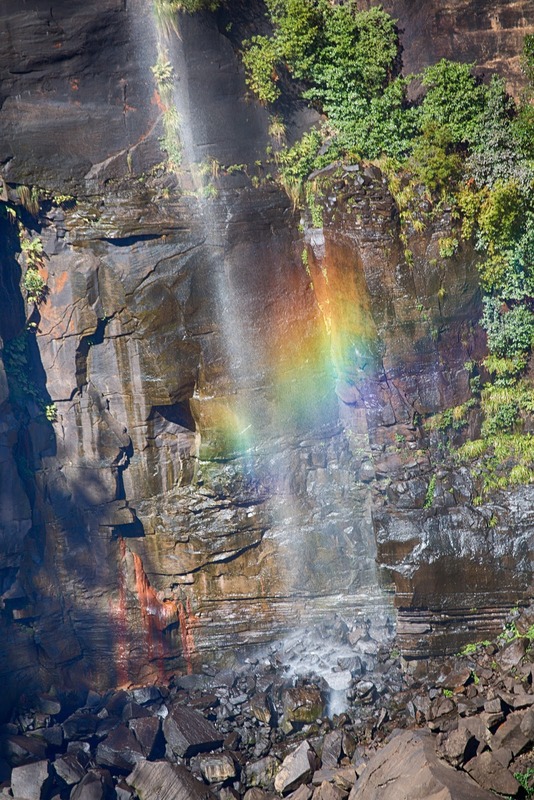 A primary rainbow sometimes forms in the wind-blown spray at the top of the Fitzroy waterfall. 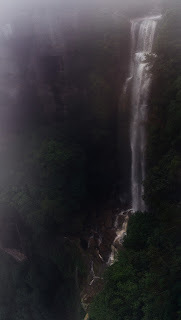 Here, the rainbow (an optical artifact dependent on the observer's position) can only be seen when the winds blow spray from below the lip of the fall back into the sky (here, back up the river feeding the fall). A primary rainbow forms in the spray of the Fitzroy waterfall, even if it is a shadow of its normal self (here, despite rain, the catchments of the southern falls are still recovering from a dry winter.) 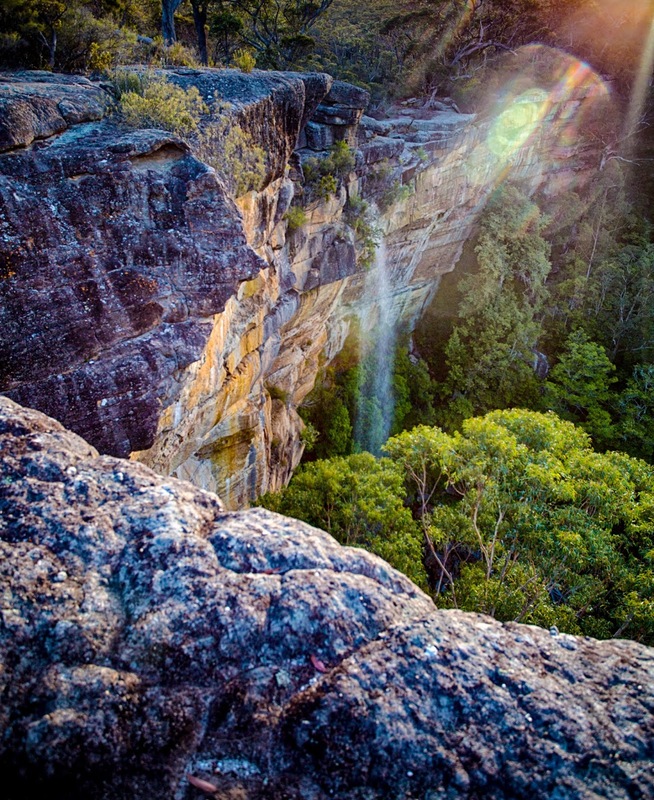 If the sun is high and behind you, and there is sufficient spray of small droplets (here aided by a high drop and a fierce wind), you may see a rainbow as you move in front of the fall. The rainbow will form only within a very narrow band and within spray. Here, I waited for the wind to disperse the spray and help widen the arc of the rainbow (note that the arc of the rainbow - around the "anti-solar point" - will change as you move position - with a large fall you may be able to position yourself to capture a wide arc). 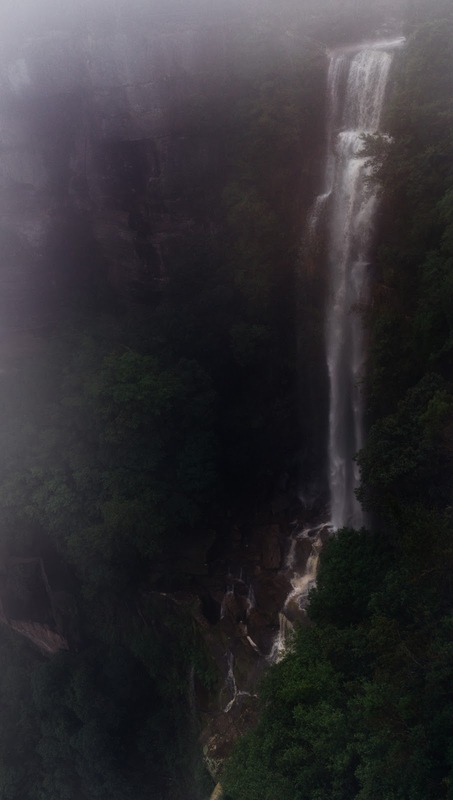 Many falls create their own winds and thick mist. Fitzroy is no exception, but the wind normally blows spray onto all the nearby viewing points. 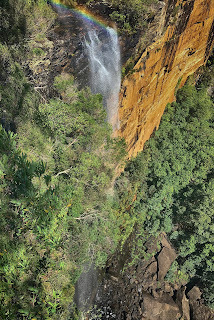 View looking from above the second plunge. 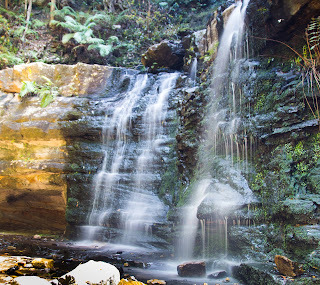 In the gorge below the main Fitzroy Falls, a lower set of cascades drains the flow into the depths. 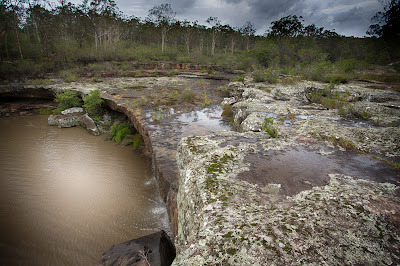 I particularly like the circular depressions visible from this vantage, perhaps base remnants of older paths of the falls, or perhaps simply weathered by the extreme temperatures. 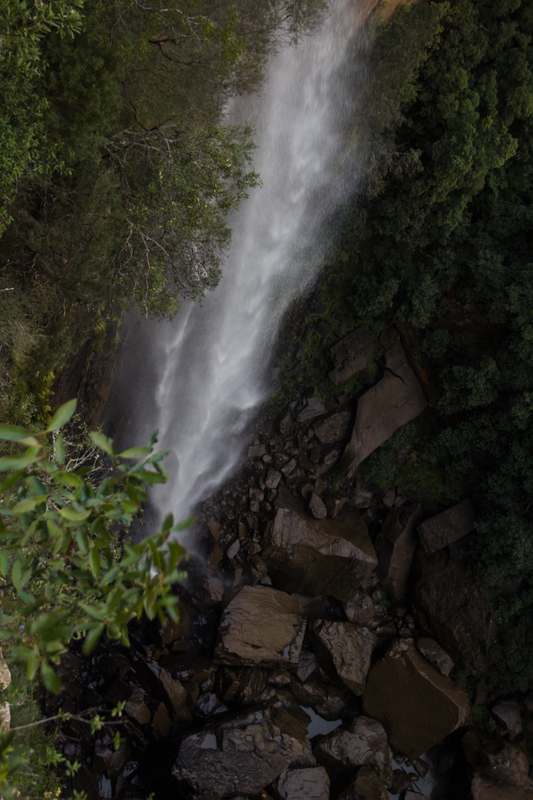 From about 100m (300') above the top of the falls, 2016. The only way practical way to get to the base of Fitzroy or its lower falls (and a number of other ravine waterfalls in Morton Park) is by abseiling in (special permission would be required - although there are a couple of abseil trainers in the area the vertical distances involve the risk of harness hang syndrome if climbing in the area). 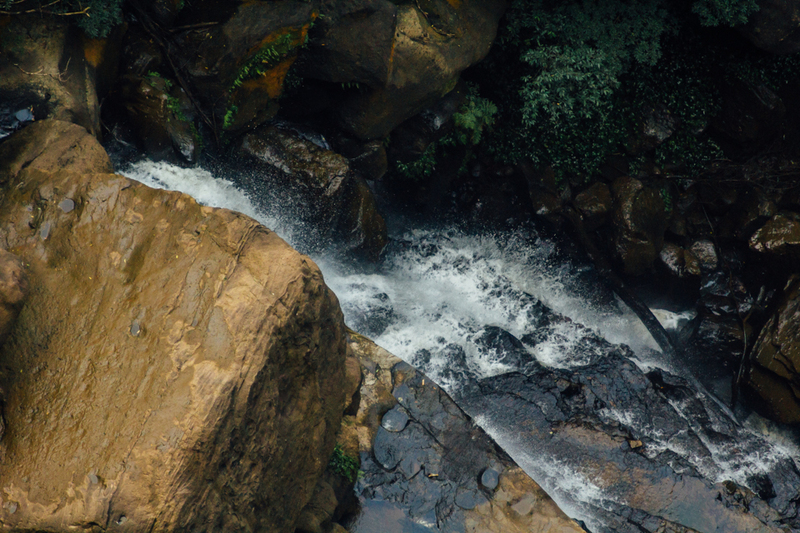 The conditions at the base of ravine falls are dire. 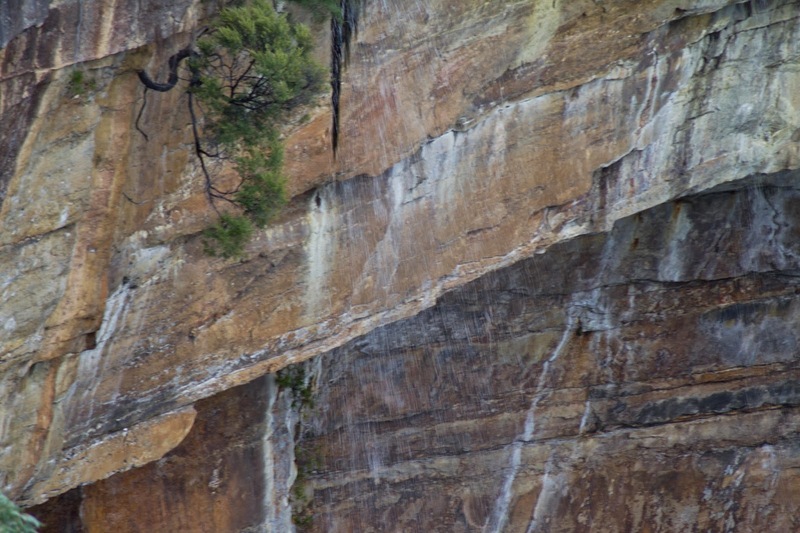 At the bottom of Fitzroy (and Belmore), a recent abseiling team reported that the wind spray draught at the bottom was tremendous. The team reported chilling towards hypothermia even with wetsuits. 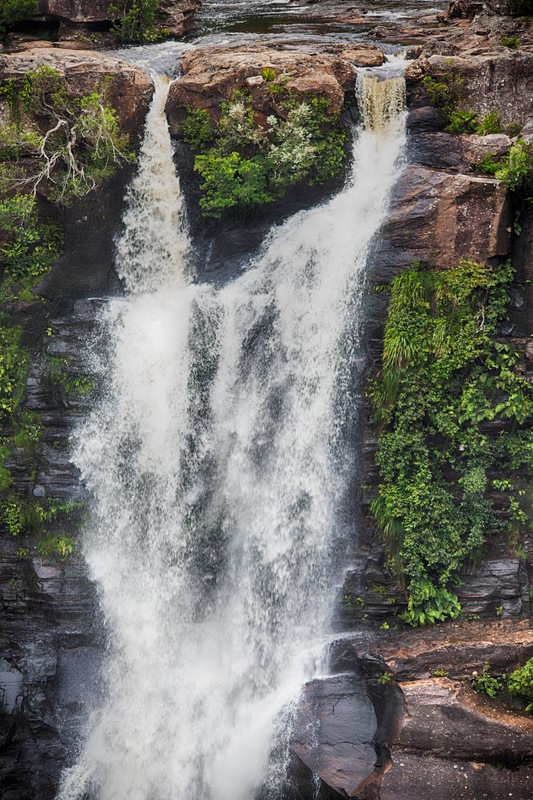 This is a two chute fall, with the two streams taking slightly different paths down the cliff. Heavy rain has not been enough to merge the two streams as they plunge down a rainforest gully. 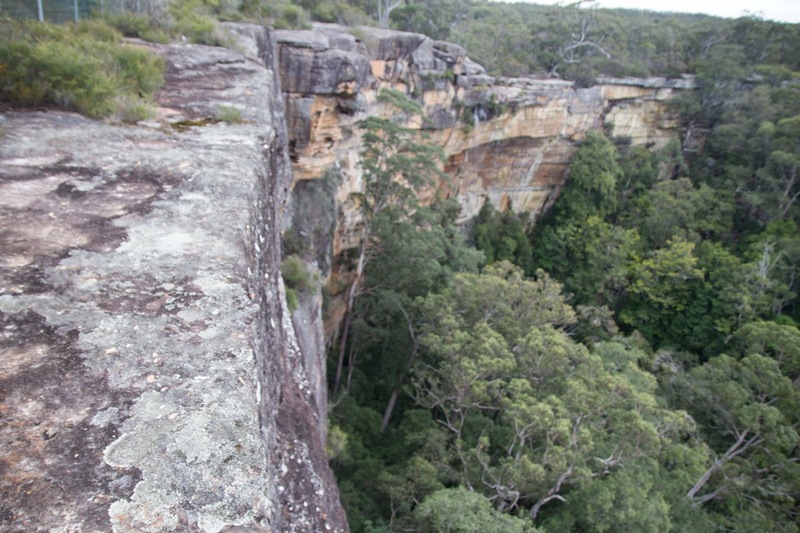 Accessed via the West Rim walk near to Fitzroy Falls. 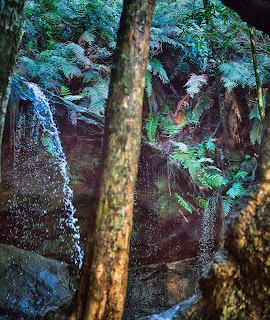 This waterfall falls alongside many small ferns and bushes. 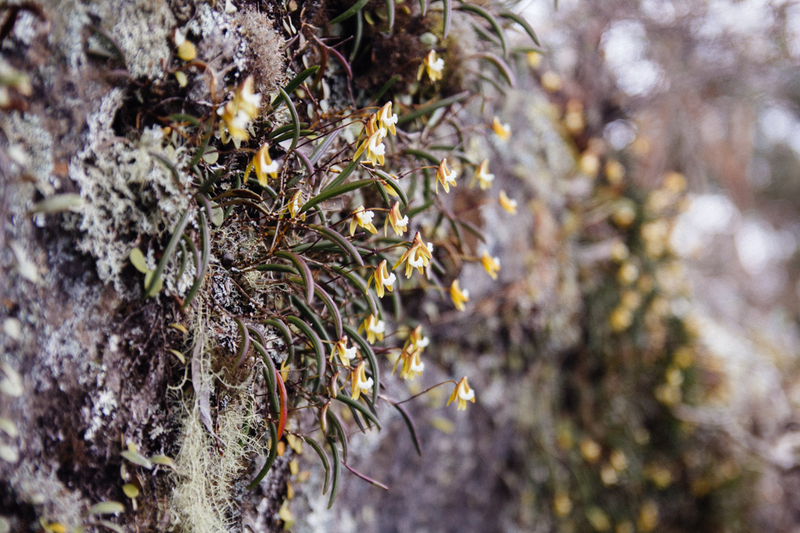 It is nice to be able to pick them out, and marvel that they survive in such a precarious situation. 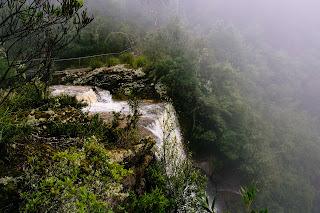 In the early morning the path is crossed by lyrebirds, foraging in the mist. And every time I come to this position, i find a different view. 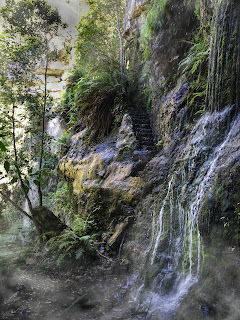 To get to Grotto Falls you must risk all and climb down the cliff face trusting fifty old stone steps that are showing their age, thoughtfully provided for curious visitors that once came a hundred years ago. Today, only the occasional visitor travels this far. 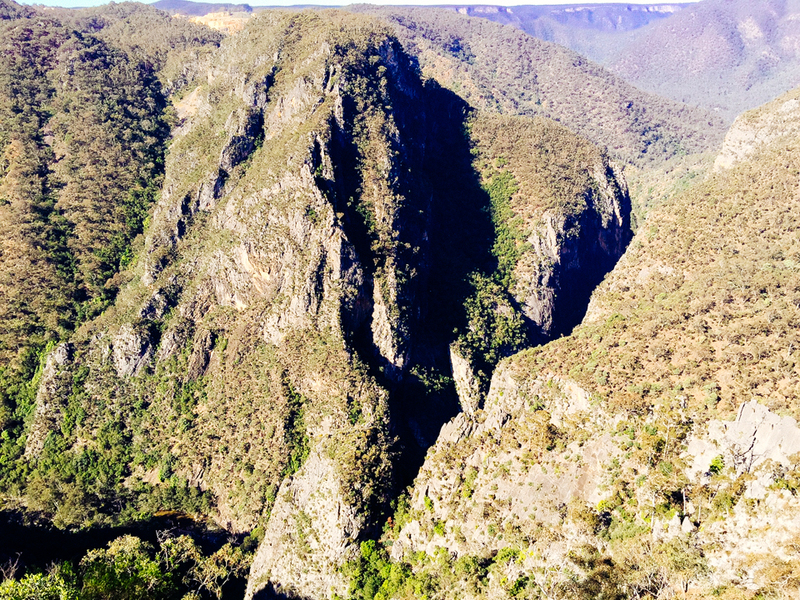 This fall and her nine sisters drop 100-200m (300' - 600') to the inaccessible valley below. When you arrive you will find a small grotto held together by ancient trees growing directly from the rock face. 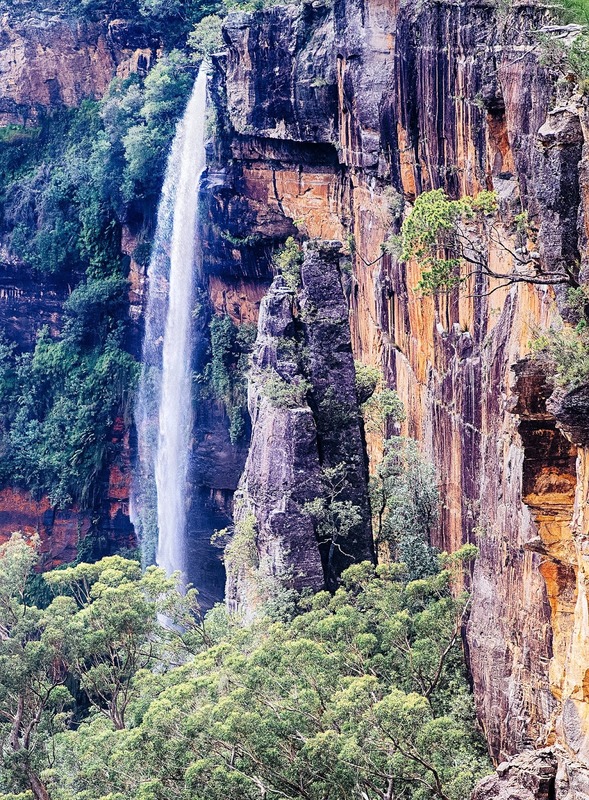 "Australian history is almost always picturesque; indeed, it is so curious and strange, that it is itself the chiefest novelty the country has to offer, and so it pushes the other novelties into second and third place. It does not read like history, but like the most beautiful lies. And all of a fresh new sort, no mouldy old stale ones. It is full of surprises, and adventures, and incongruities, and contradictions, and incredibilities; but they are all true, they all happened." 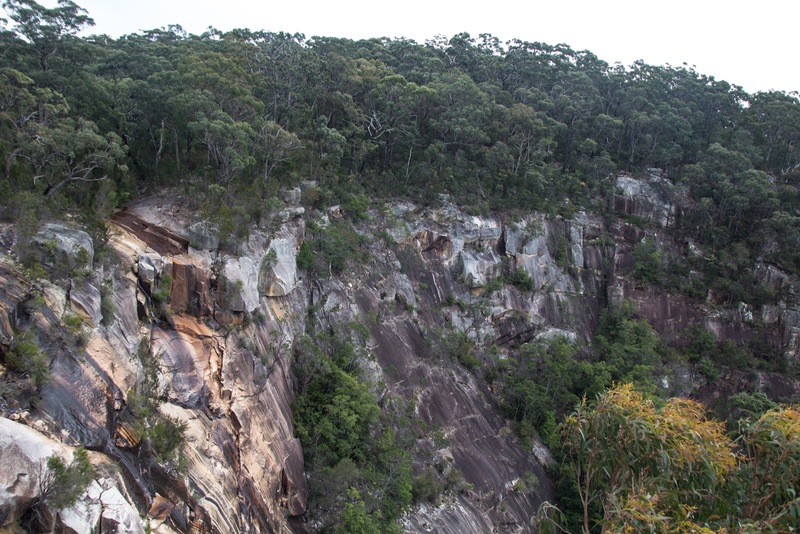 The Yarrunga Creek hosts nine high falls, including the two with the largest drops, Fitzroy (90m, rear) and Lady Hordern (75m, foreground). Many visitors come for Fitzroy, and leave unaware of the others (most can be seen on the West Rim rack). There was once a dangerous track down into the wilderness below, but today the area is inaccessible. These two falls can only be seen from two remote lookouts on the west rim path: Renown and Starkeys. 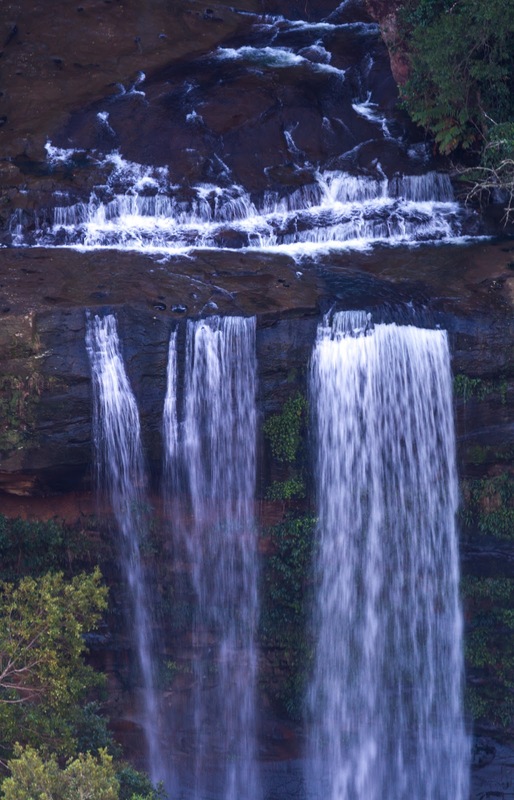 The Kangaroo River falls 90m (270') into the Upper Kangaroo Valley over a sandstone escarpment. 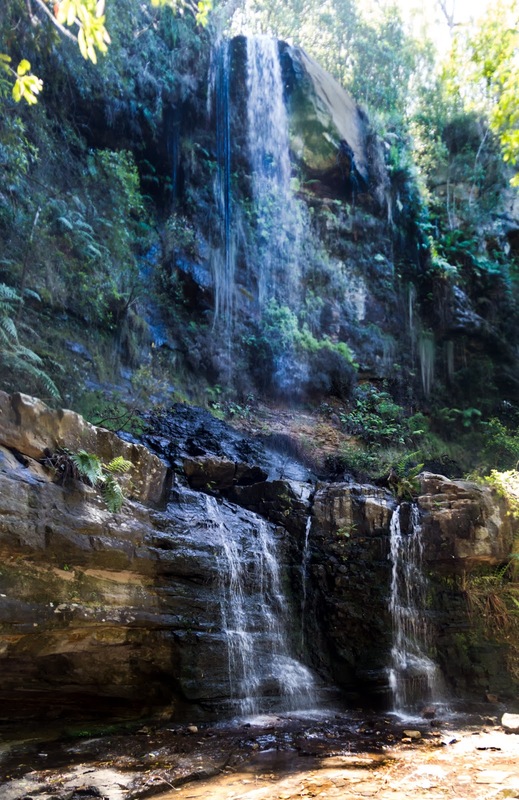 In Australia, even waterfalls burn in the summer heat. 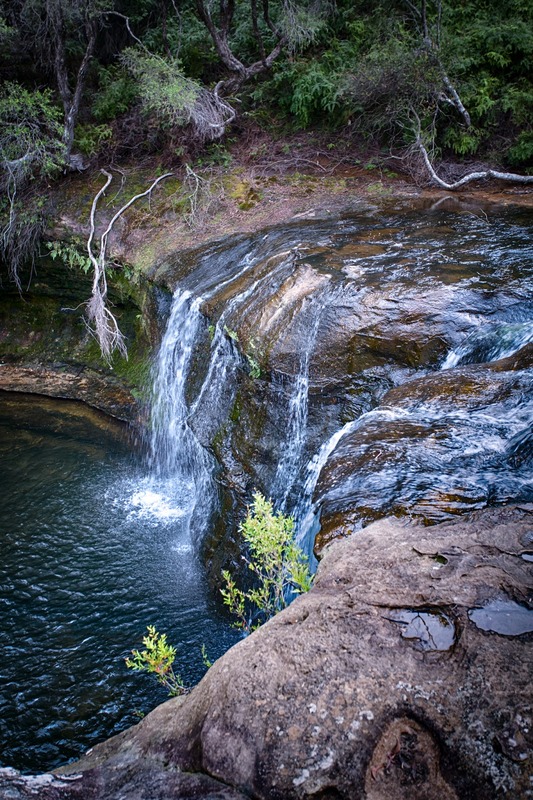 A couple of years ago Carrington Falls on the Kangaroo River burnt. 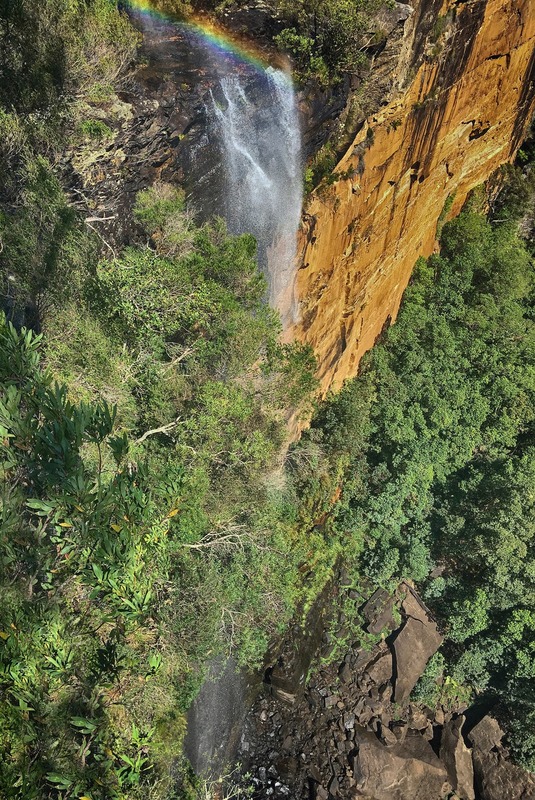 As of the time of writing, it is still dangerous to venture into the area (the waterfall still works, but fire makes the tall trees and the rock cliffs unstable). Near the highland town of Robertson, the Kangaroo River has cut a series of high waterfalls and a couple of waterholes (Nellies Glen) into the escarpment. 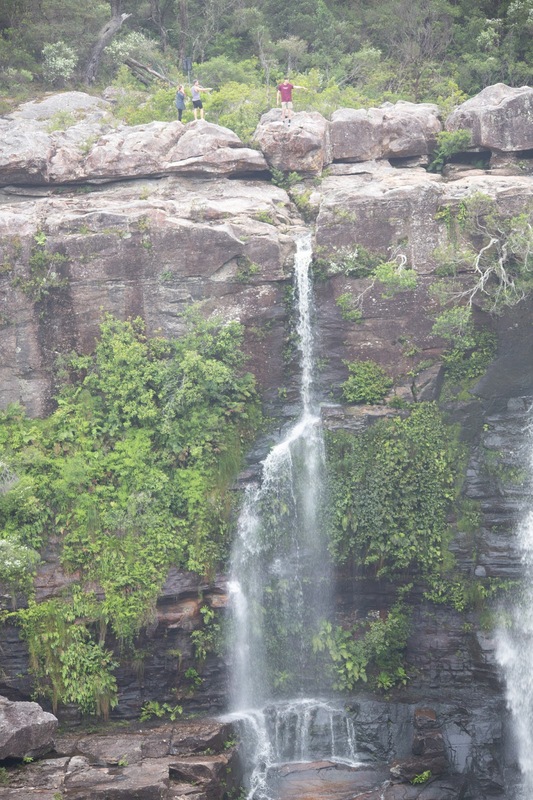 Many of the lower waterfalls are inaccessible. 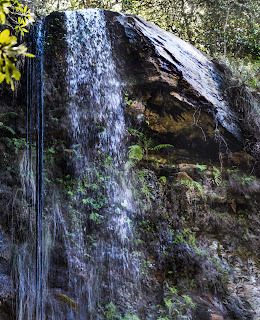 Some canyon waterfalls can create their own wind. 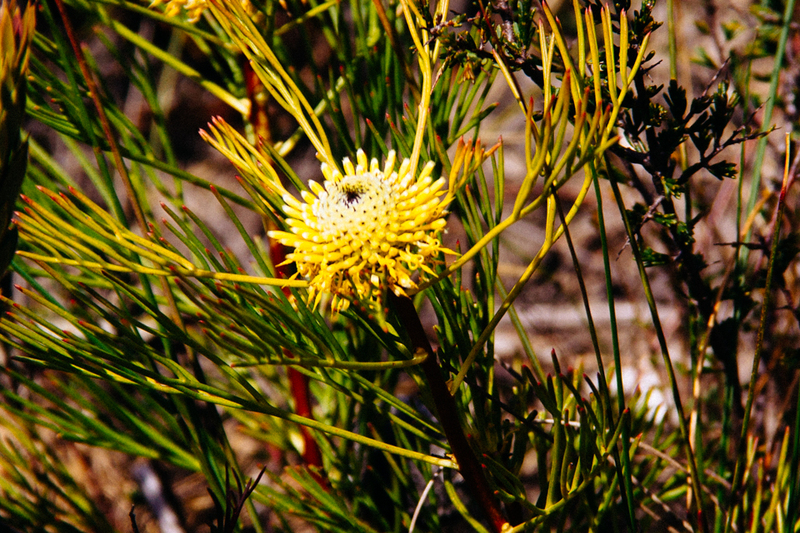 In combination with ordinary weather and bushfires, this can create dangerous conditions for hikers. 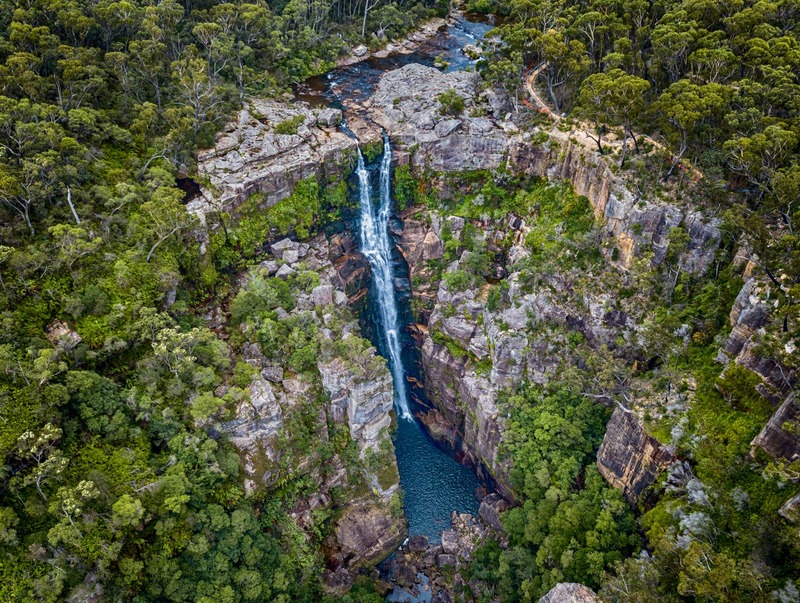 The impressive Carrington Falls is accessible, but (as of October 2018) viewing platforms are closed due to fire damage (present status can be checked here). 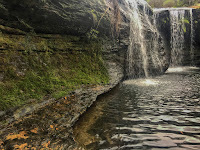 Above this fall and a little to the left is a large swimming hole with its own fall (Nellies Glen) which remains open. 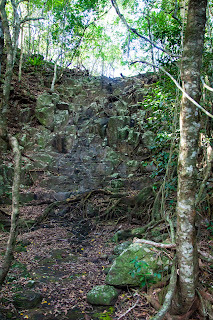 There is no apparent access to the base of the waterfalls although there are accounts of people descending into the canyon near Missingham’s Steps, but this seems a fraught path. Budderoo National Park, access by traveling along the Jamberoo Mountain Road from Robertson or Jamberoo. 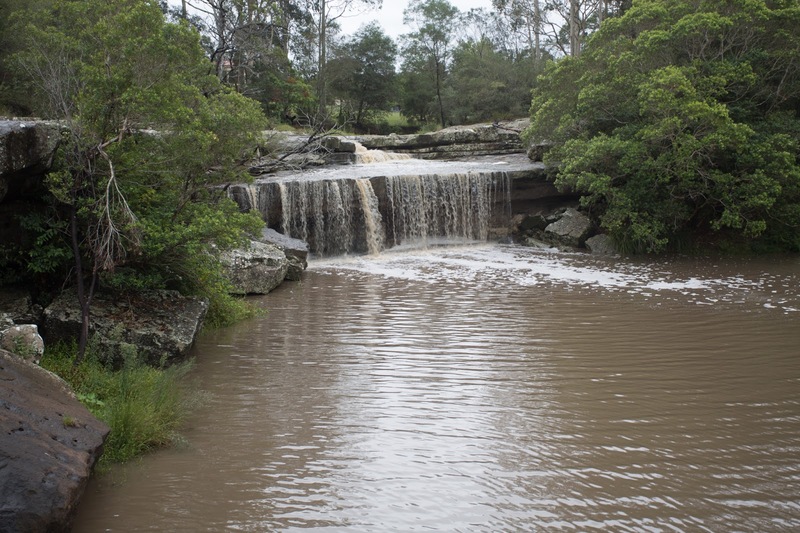 Turn onto the unsealed Cloonty Road at the Carrington Falls sign and follow for about 2km. Watch the road signage carefully, as online maps may take you to the wrong location. 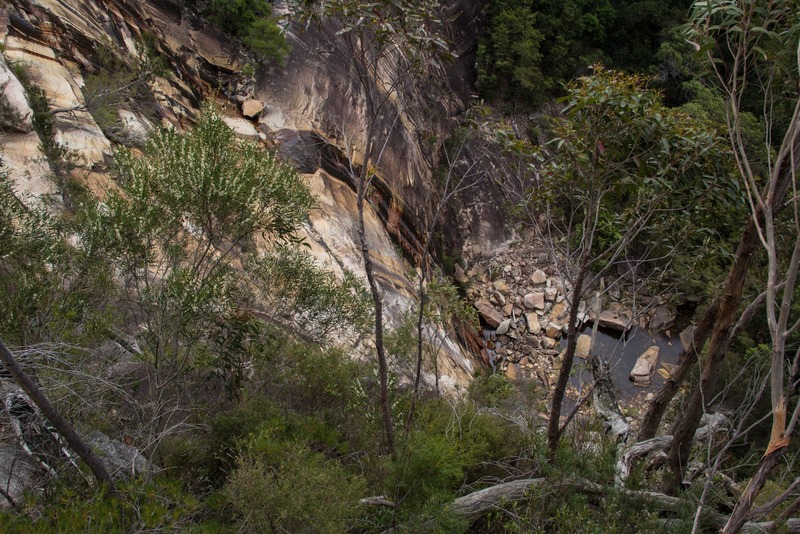 There are two separate car parks, one for the waterfalls (closed in 2016 due to bushfire damage), and the other for walks (open in 2016). 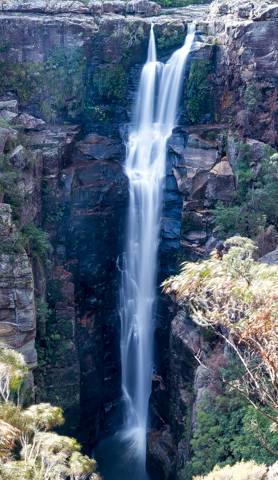 The waterfall was named after the Governor of NSW, Lord Carrington (1885-1890) (in later years, he was known as Charles Robert Wynn-Carington, 1st Marquess of Lincolnshire). A liberal (even perhaps a radical) he was a champion of colonial independence: his encouragement and support of a federation of Australian states was an important driver to the creation of a unified Australia. 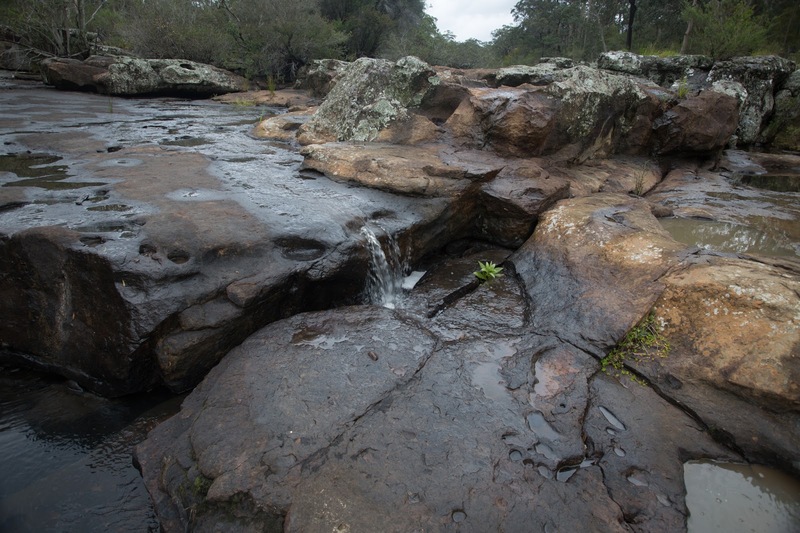 Top of Carrington Falls - note 'snow' bush flowering between the main flows. In Australia, even waterfalls burn in the summer heat. A couple of years ago Carrington Falls on the Kangaroo River burnt. 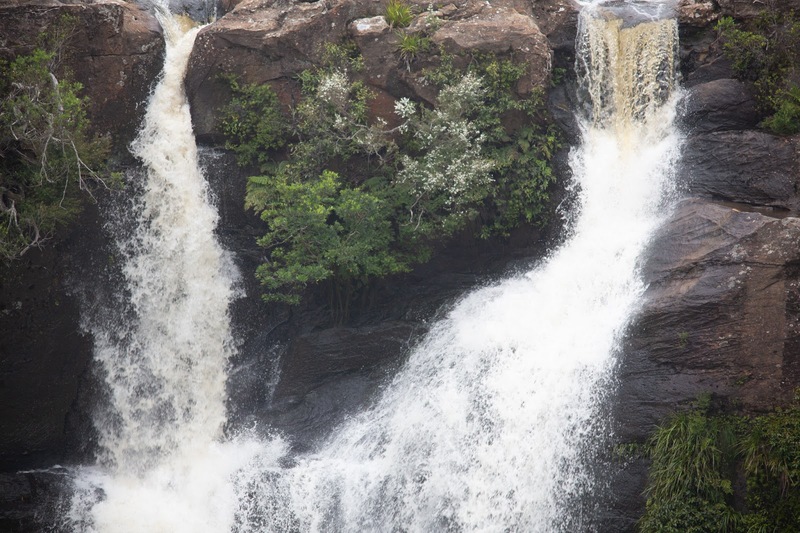 Viewing and recreation areas have just been reopened. 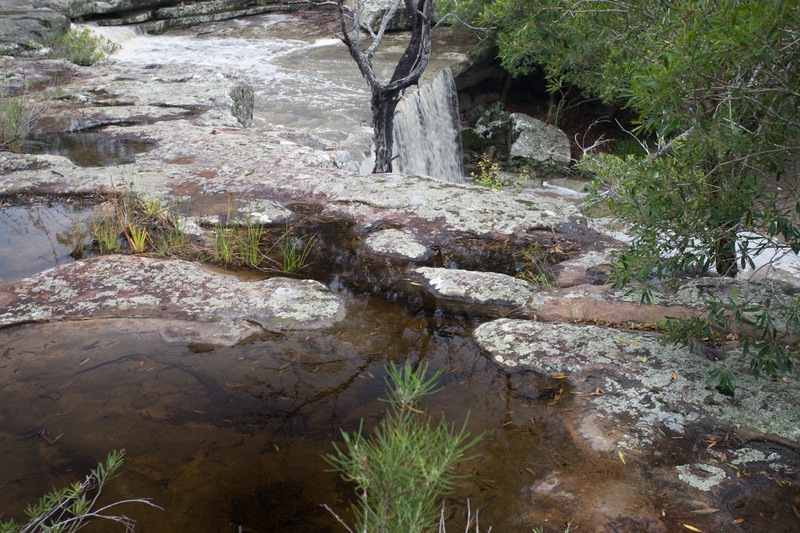 I sometimes see a fall's structure reflected in the surrounding rocks and vegetation - perhaps an inevitable result of fall wind and vibration. Here the tree roots echo the fall . I advise against swimming in or under falls, but there are a couple of exceptions such as Wadbilliga and this place, Nellies Glen. 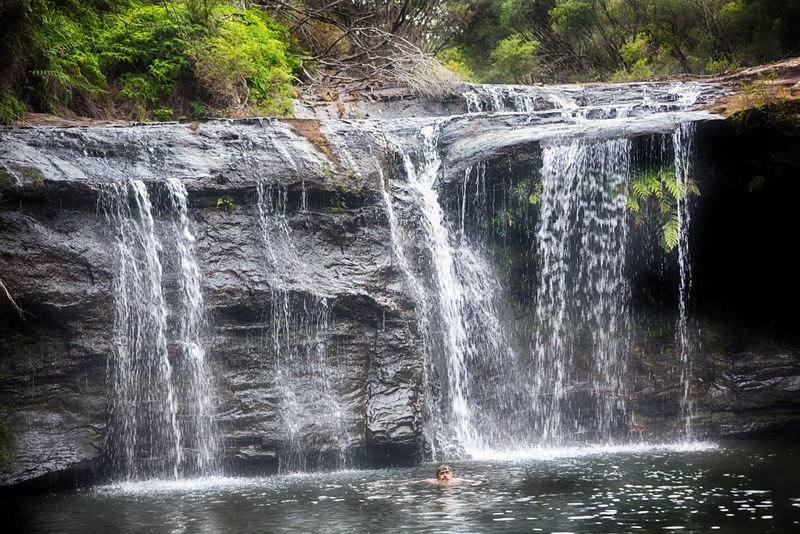 This is a cold (the expression on my face is a guide to the temperature) but lovely swimming hole. 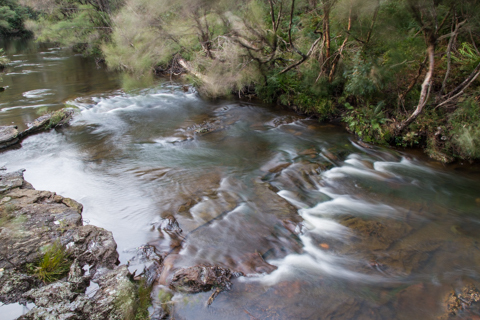 The Wallagunda River (sometimes called Barrengarry) drops 330m (1080’) in a series of plunges to the Kangaroo River. The River has carved a deep gorge into the surrounding Barrengarry Valley, plunging down four large waterfalls. 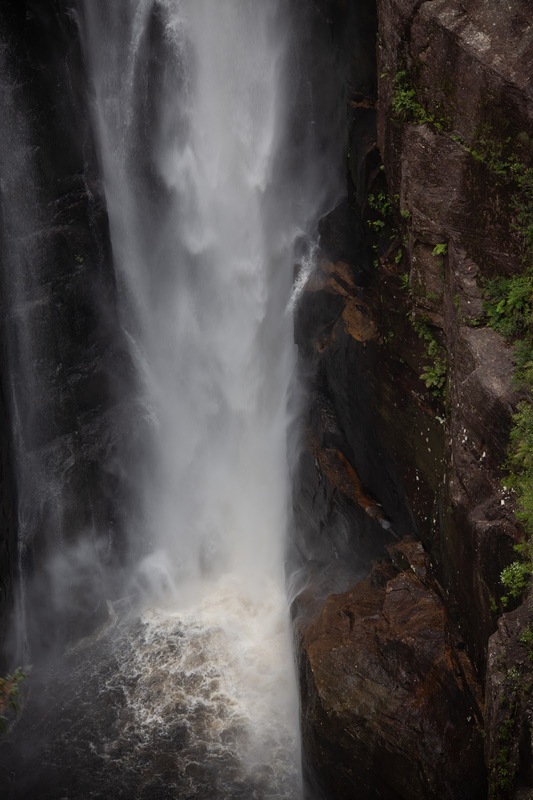 The lower waterfalls are inaccessible today. 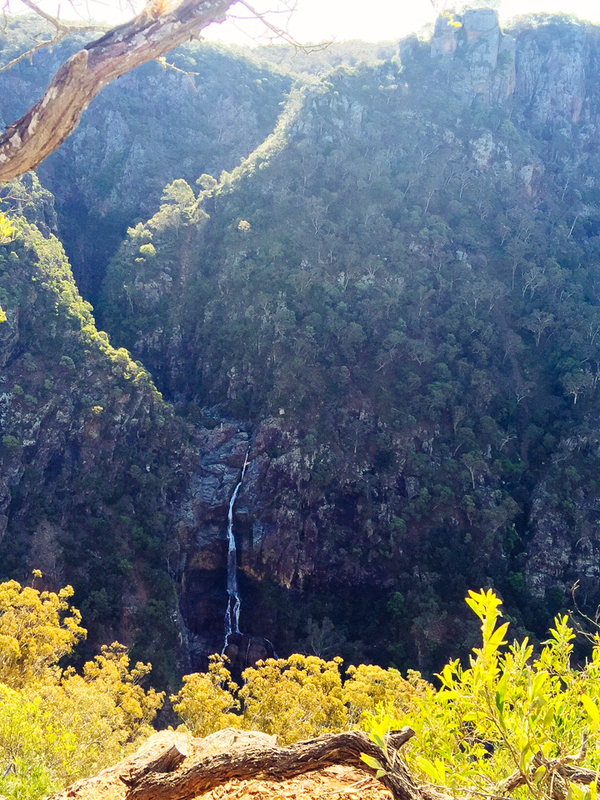 Settlers came upon these falls in 1870. 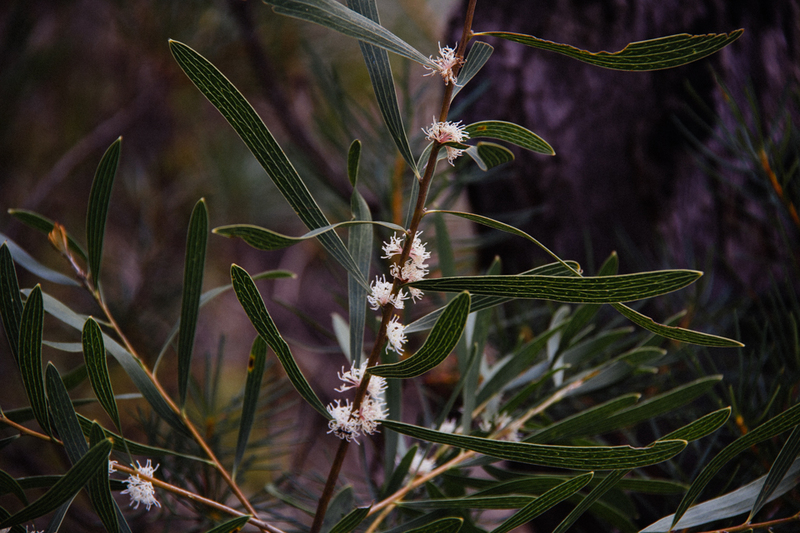 They were named after the then Governor of New South Wales an Irish Earl: Somerset Lowry-Corry, 4th Earl Belmore. He served in troubled times. Early in his tenure (1868), there was a Fenian assassination attempt on the visiting Prince Alfred (and himself) at Sydney. He is partly credited for forestalling a general Irish uprising in the Colony, although some parts descended into chaos. 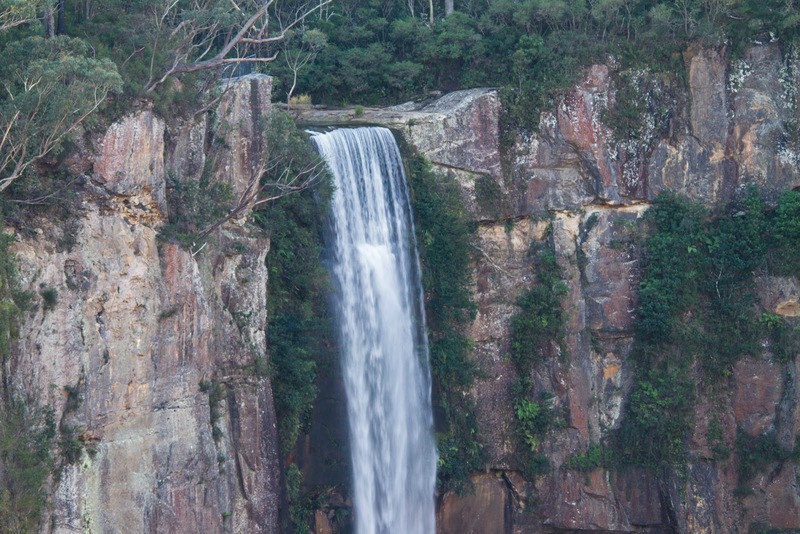 Belmore Falls has two slightly offset direct waterfalls. 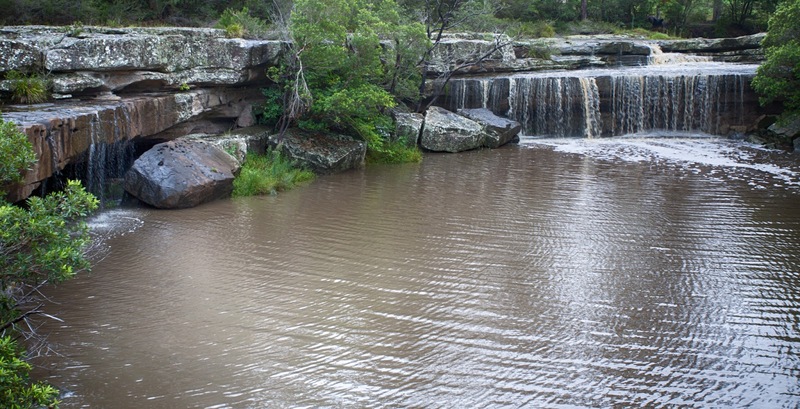 Midway down the cliff, water collects in a pool, before cascading down the second plunge. The river flows, in part, through fragile honeycombed rock connecting pool and plunge. 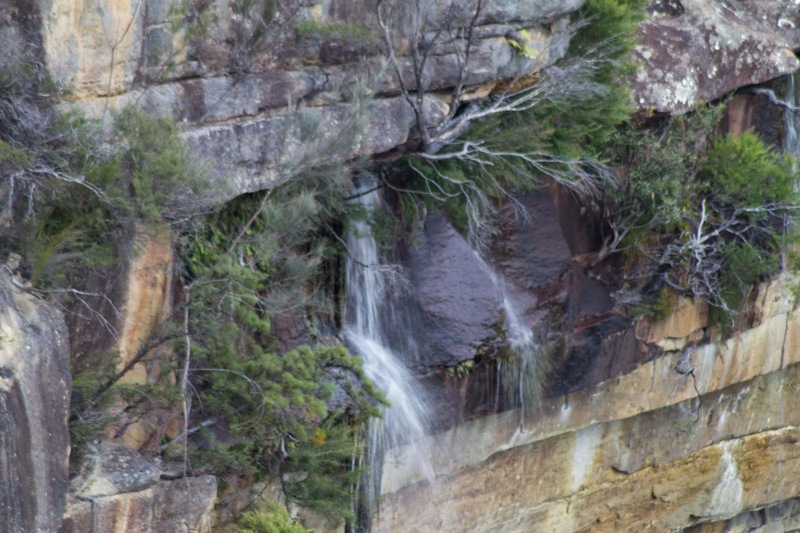 The detail shows water forcing its way through rock at the top of the second plunge. 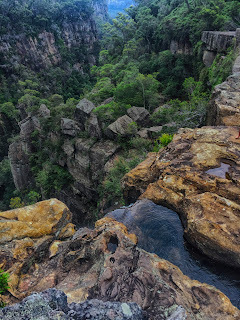 Climbing to the middle pool is dangerous and has been the scene of some serious injuries (even from relatively minor slips). Today it is prohibited. 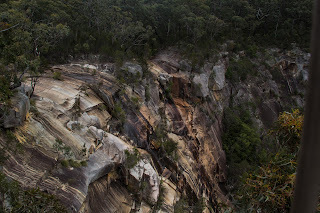 A long ribbon waterfall which can retreat into the rock face in dry periods. 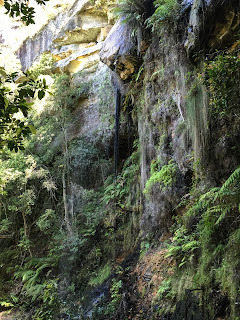 Notes: In a deep canyon, the Jerrara Creek fall through a series of cascades (200m, 600') on its way to the Shoalhaven River. 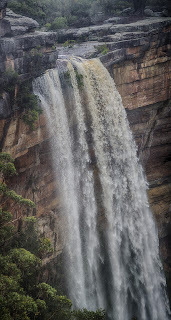 This is the final fall (80m, 240') in the cascade. 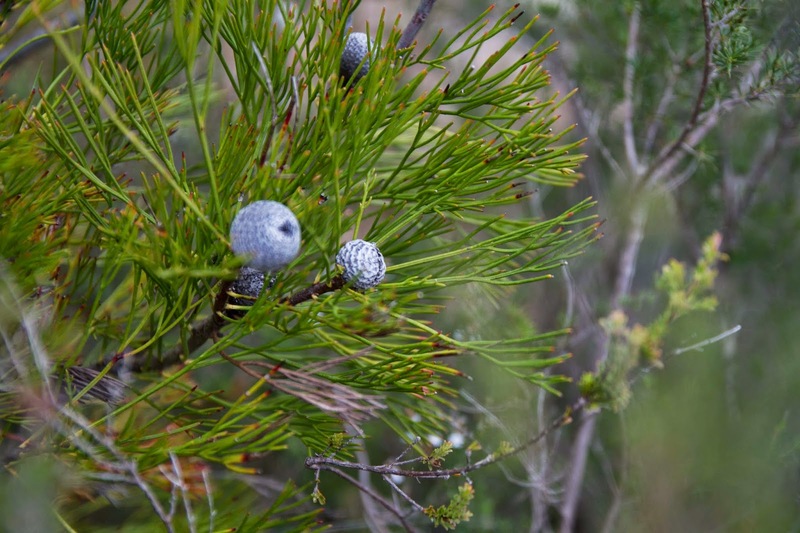 The trees at the base are retained to give a sense of the fall. 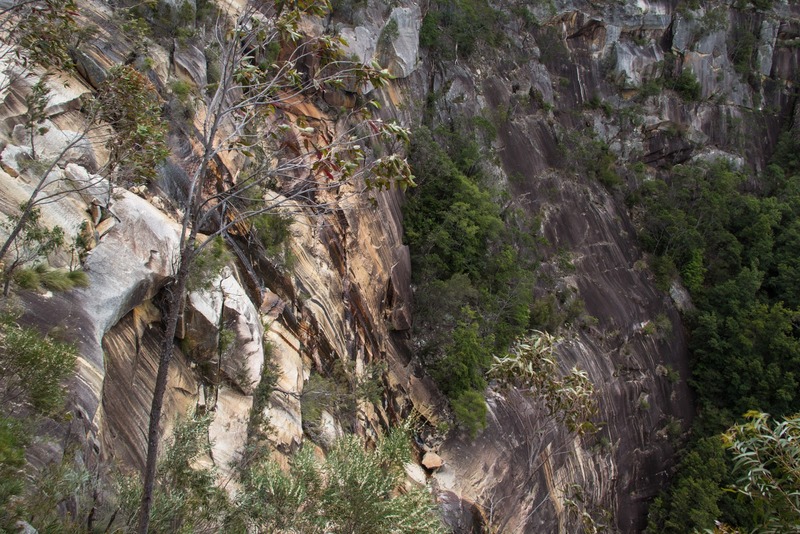 Access can be gained to the top of the canyon, but the canyon is dangerous when the creek is running and if you start to descend the canyon it may be impossible to proceed without experienced abseiling support and lots of rope. 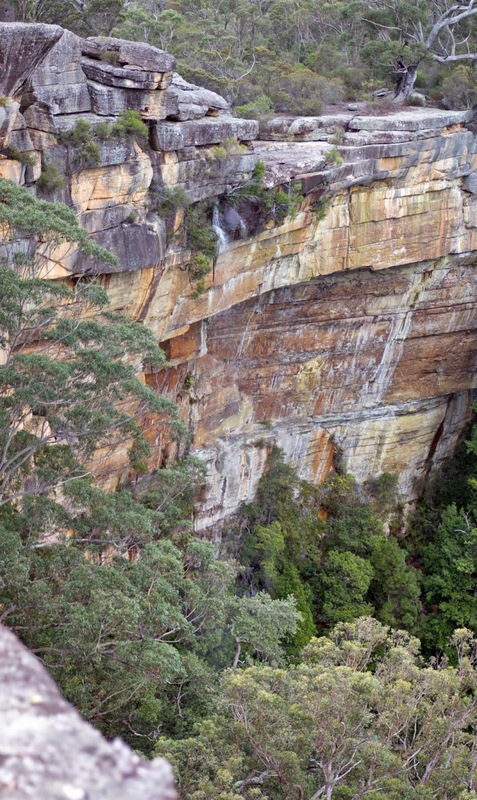 The surrounds to this area are very rugged. 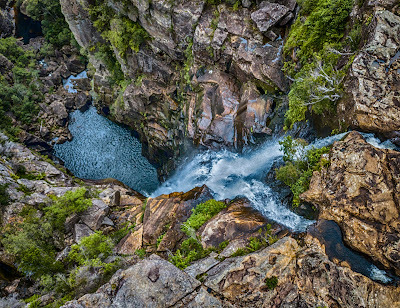 Bungonia Creek plunges toward Jerrara Creek through a steep canyon with a number of medium-high falls (including Bungonia Falls) that can only be seen by experienced abseillers. 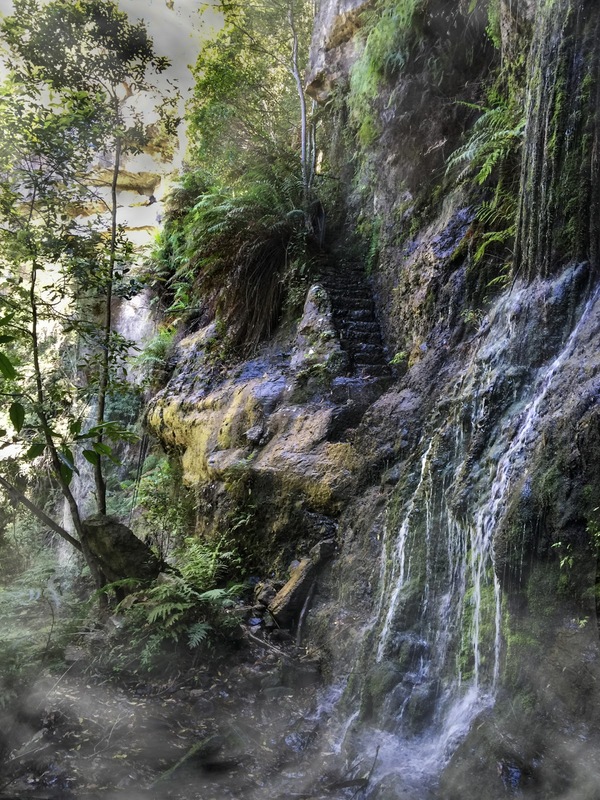 However, on the track to Jerrara Canyon, you might catch a glimpse of this water-carved pillar that sits close to the top of one of the waterfalls. 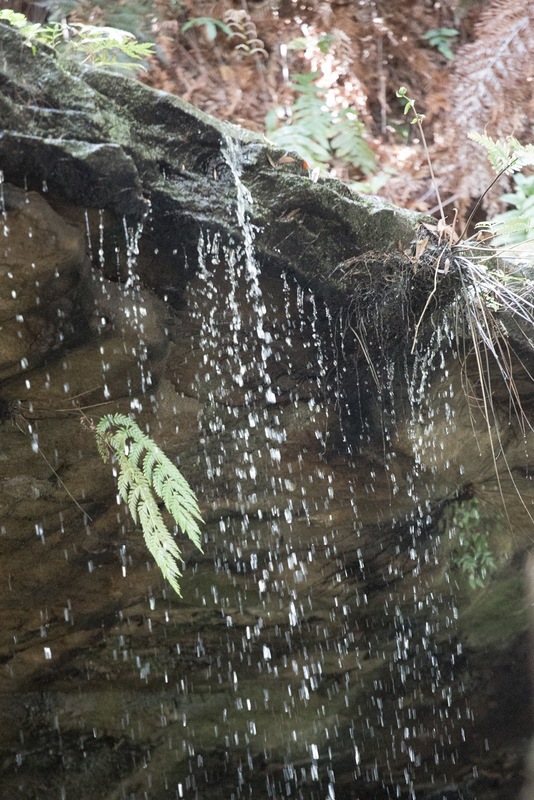 Stand-alone water-carved pillars are an unusual feature. Even human made stone pillars can erode fairly quickly, without the provision of a special capstone and surface treatment. 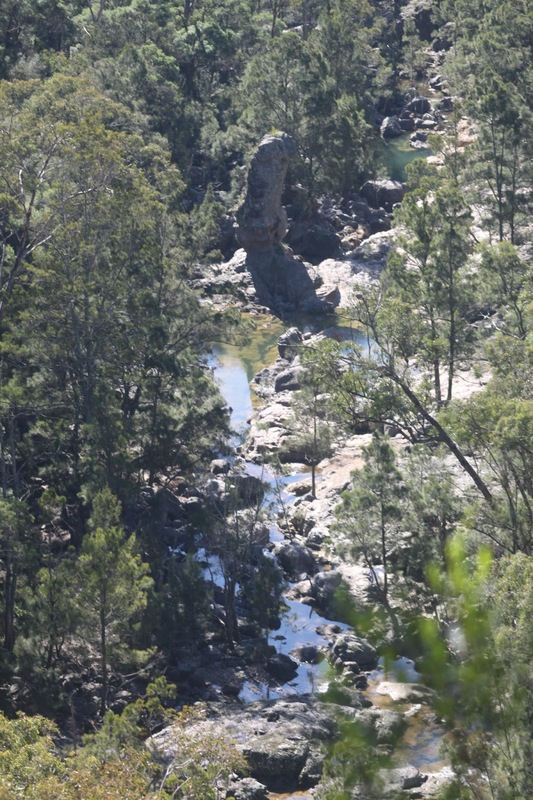 There is a single (precarious) earthen pillar, called the Totem Pole, in the Wollemi Wilderness formed by weathering below on each side of a hard rock capstone (which has defied recent attempts to re-discover). 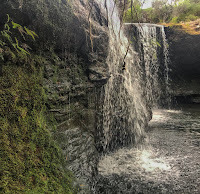 There is a more traditional fractured Basalt pillar in the earth-quake debris that forms Mermaid Pool in the Bargo Canyon (and dozens of examples of exposed basalt pillars on our shore lines). 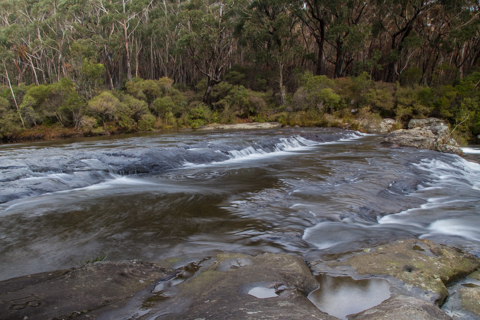 That this one still stands in the center of the Bungonia Creek (which floods regularly) defies imagination. The Parma and Currambene Creeks meet in a large waterhole near the Pacific Ocean. The waterhole (about the size of a large playing field) offers the unusual perspective of two same-height overhang waterfalls, that can vacillate from a complete halt in summer heat to rage in flood at other times. Access is from the nearby town of Bundanoon and the Morton National Park (Bundanoon Loop Road). The walks in the park are well signposted. The Fairy Bower Walking Track will take you down to the top of the falls (avoid the temptation to take a side path to the picnic area - this is a very long train away from the waterfall). 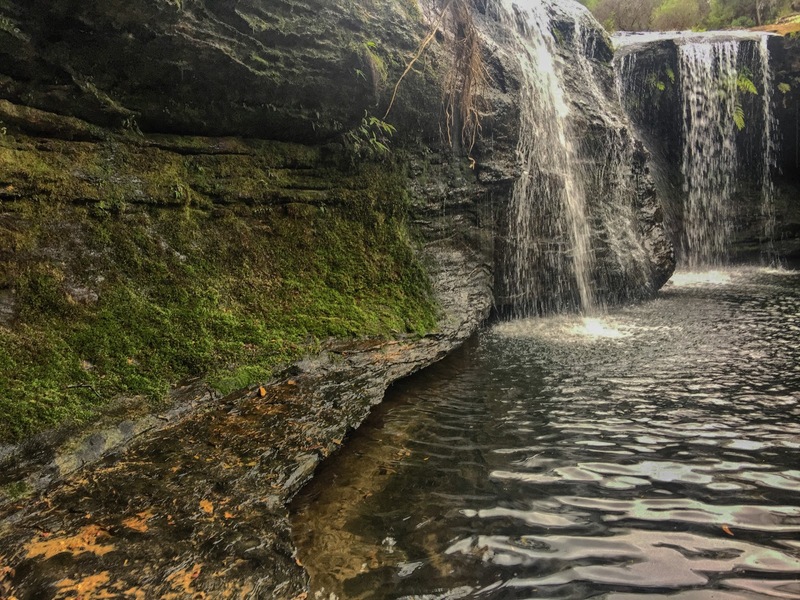 After visiting the top of the fall, the trail will take you via a circuitous route to the base of the fall, through a breathtaking cliff face walk. 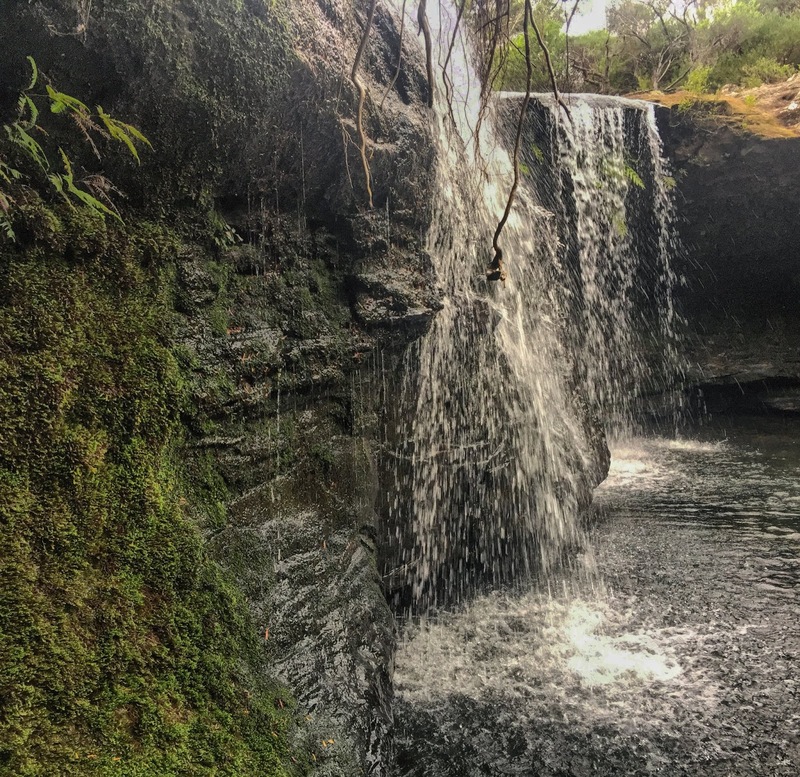 These falls have a number of unusual features, including a ruined staircase (which used to give access to the top of the main fall) and hanging tree roots. 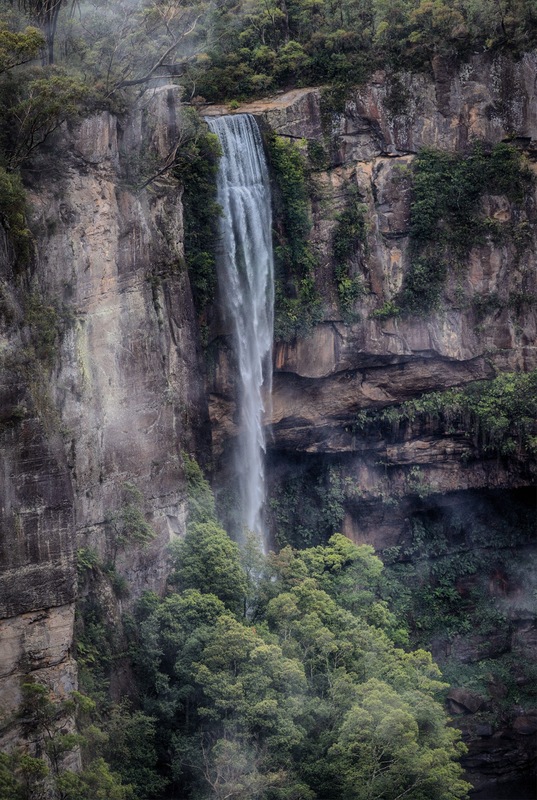 In the early morning or late evening, the area may be filled with mist (some from the main fall in the mid distance. A plunge waterfall over a sandstone escarpment 100m (300'). Tianjara Creek (sometimes called Yarramunmun Creek) is usually fairly small, and the volume of water is usually slight except after rain. It is difficult to source some of these names, and i assume most have first people derivation. This might be an exception. South East Americans have inherited a Spanish word to describe potholes that form in desert granite country: tinaja [tɪˈnɑːhə]. I wonder if this might be the source of the name. 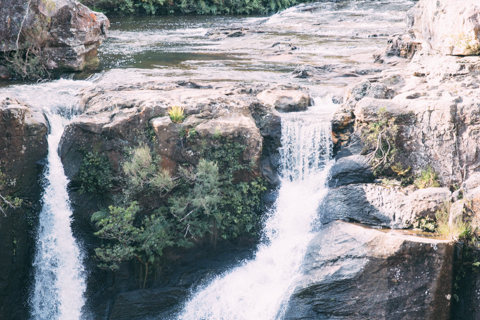 In early morning or sunset it is easy to become a little disoriented at the top of waterfalls and find yourself in the wrong place. 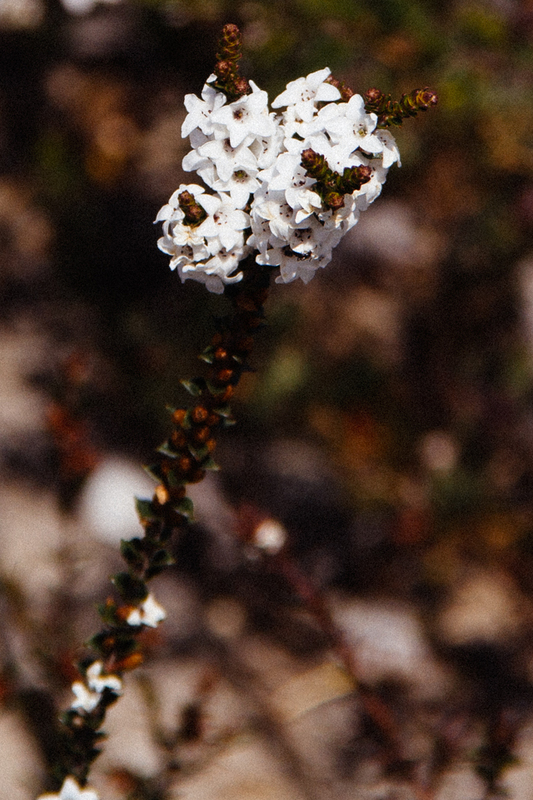 It is easy to forget yourself in a place like this. It is always safest to stop and take stock. Shadows move fast, creating illusions: paths that do not exist, flat rocks that slope alarmingly, and firm surfaces that crumble even as you watch. At Tianjara, near me, the silhouette of a face took form and darkened. Then the sun's horizontal rays hit the edge behind a waterfall and set the rock wall on fire. 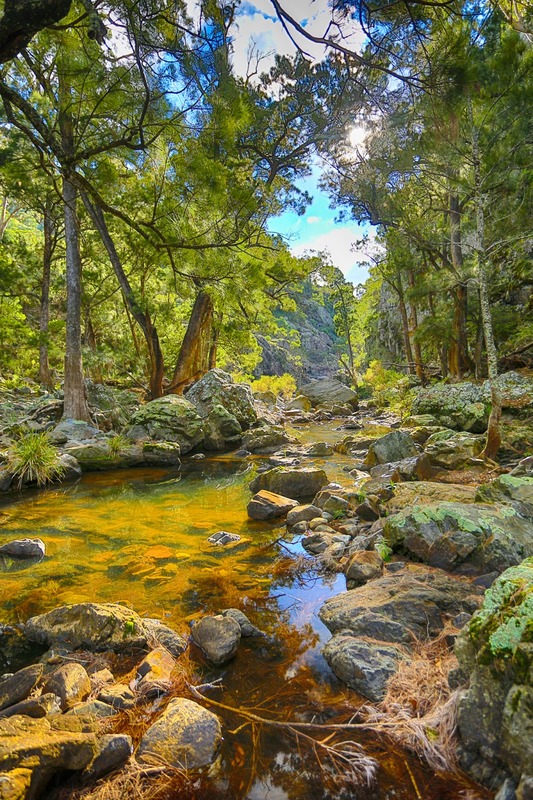 This fall is in the Morton National Park, access by travelling along the Braidwood Road (the Old Wool Road) between Nerriga and Nowra, SE Australia. 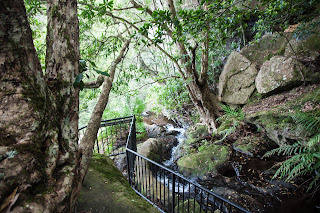 The falls are well signposted, and there is a short walking track to the falls from a large carpark. 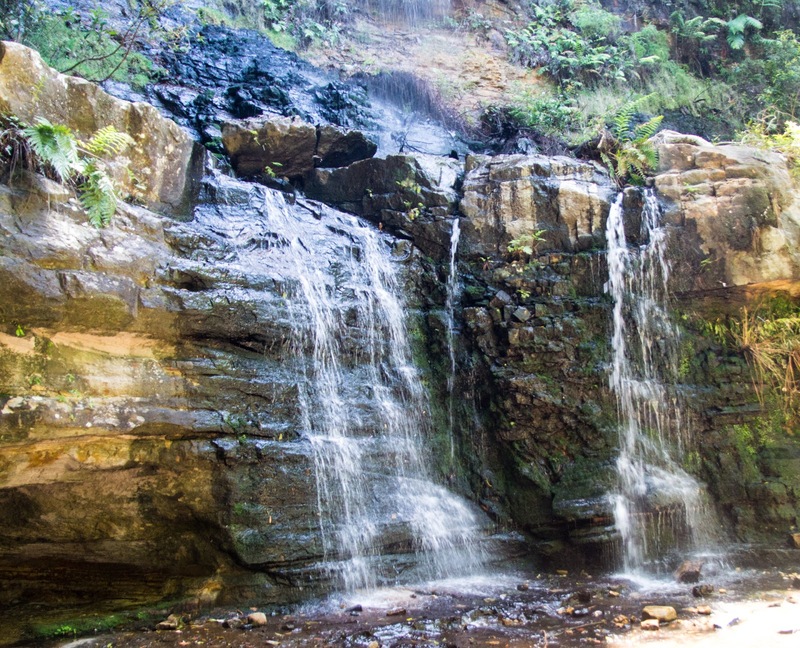 Viewing of the falls is from a well-maintained metal structure and there are short walks along the escarpment. There is no apparent access to the base of the falls but old diaries suggest a distant ridge might be followed to the base to the south west. 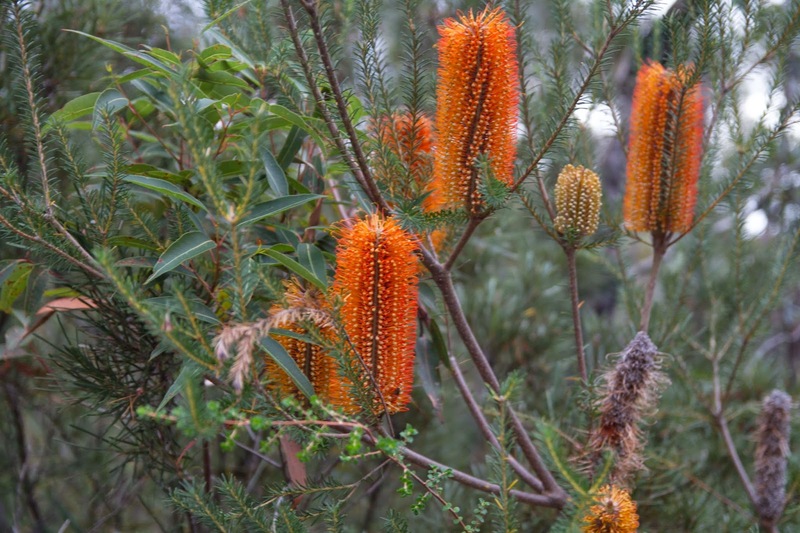 The area puts on a stunning display of banksias, after Spring. 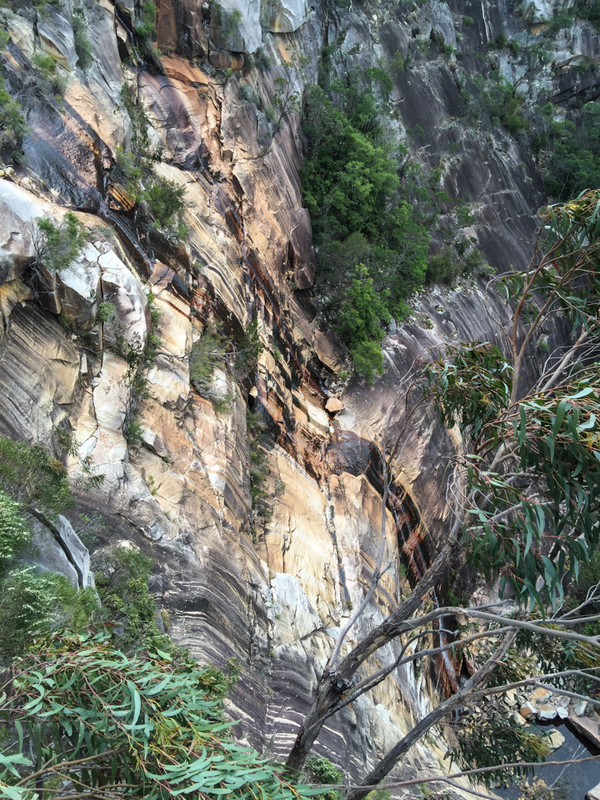 A ribbon waterfall 63m (200') over an unusual granite cliff. 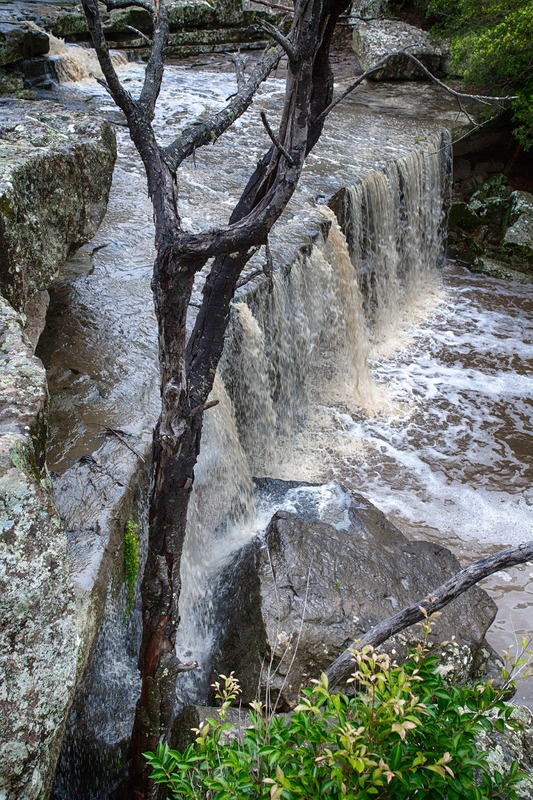 The creek is usually fairly small, and the volume of water is usually small except after rain (when access to the falls may be dangerous). 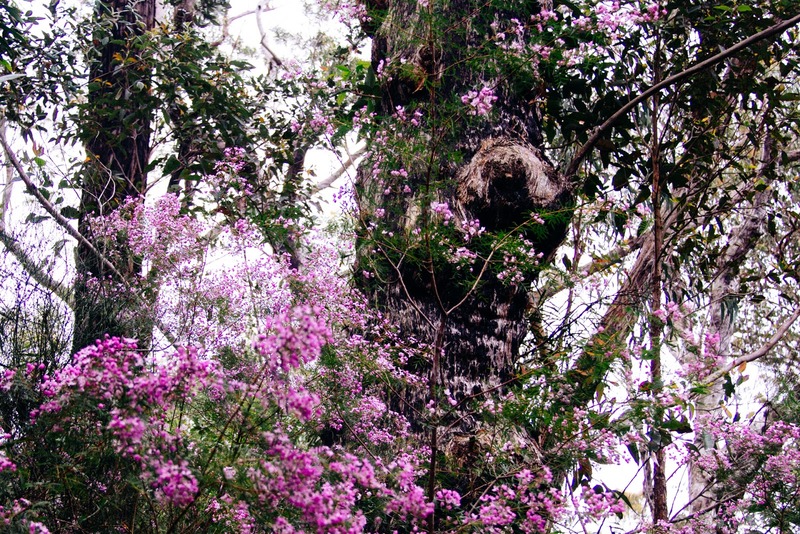 Access is from the Princes Highway. 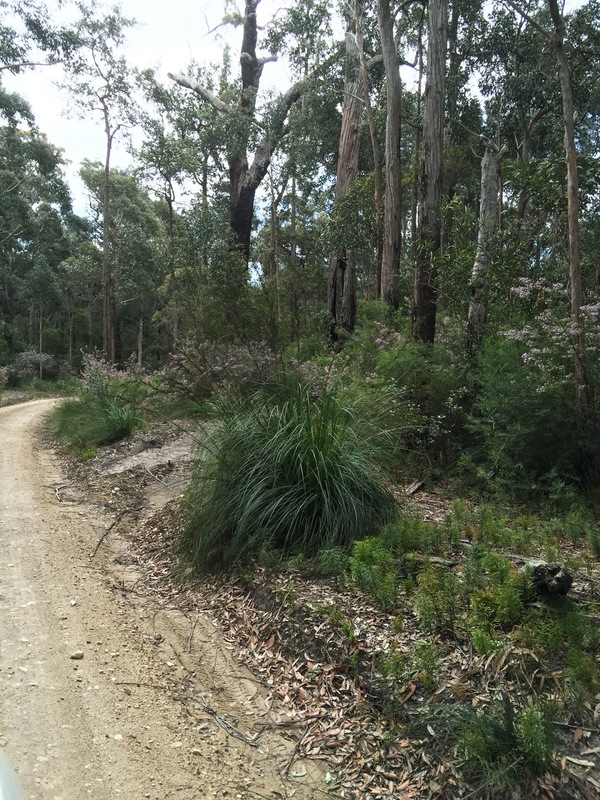 A second low grade access road (the Twelve Mile Road between Tianjara and the Princes Highway) is not recommended and was closed in 2016 for bridge work. The falls are well signposted, and there is an excellent walking track to the falls from a carpark on Tin Road. 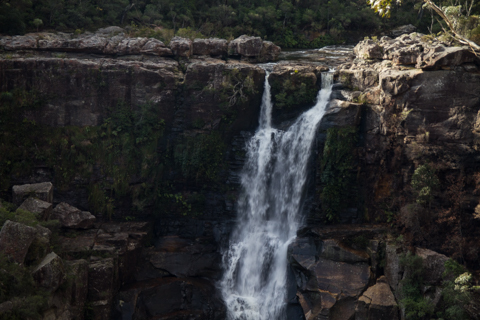 Viewing of the falls is from a well-maintained metal and wood structure. There is no apparent access to the base of the falls. 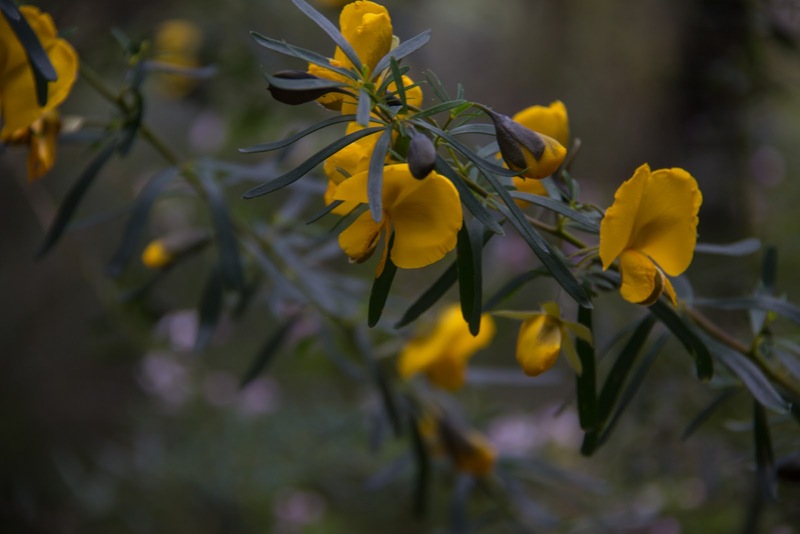 In early October, the access track is fall of wildflowers. 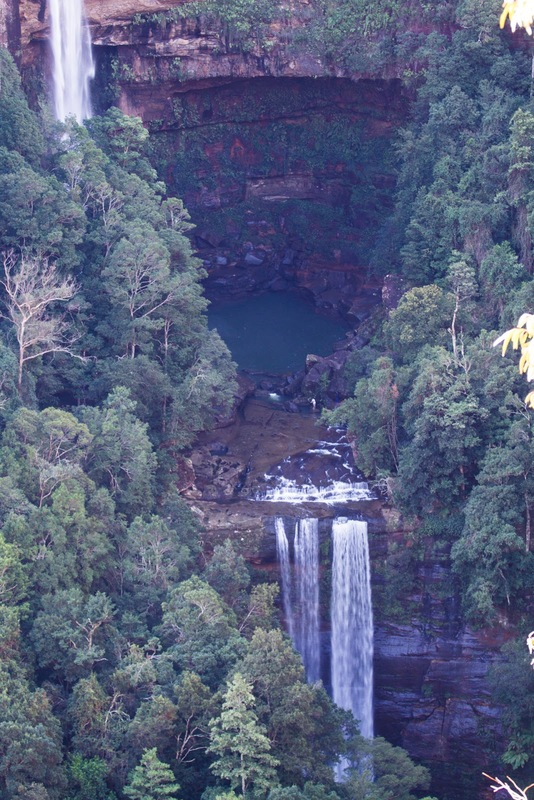 The nearby George Boyd Lookout, offers toilet, limited telephone/internet signal, picnic facilities and a rainforest walk. 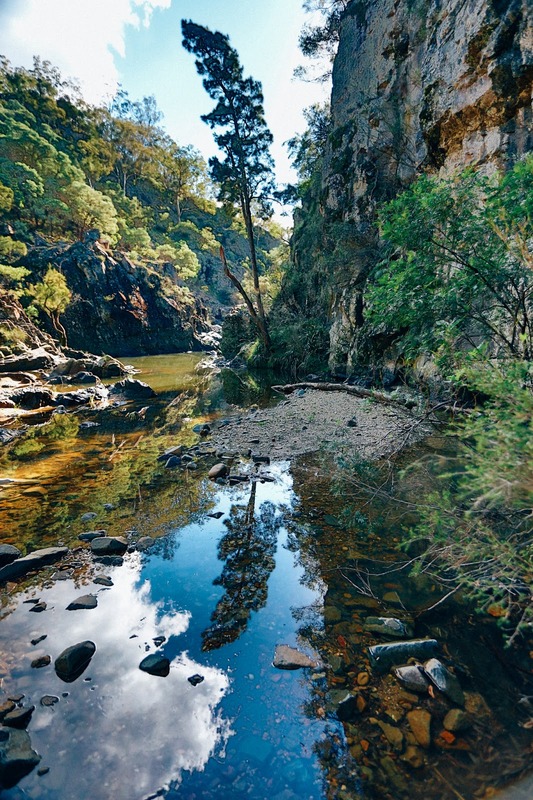 Close to the Pacific Ocean in southern New South Wales, the Currowar Creek leaves a fertile plain and suddenly plunges into a ravine. 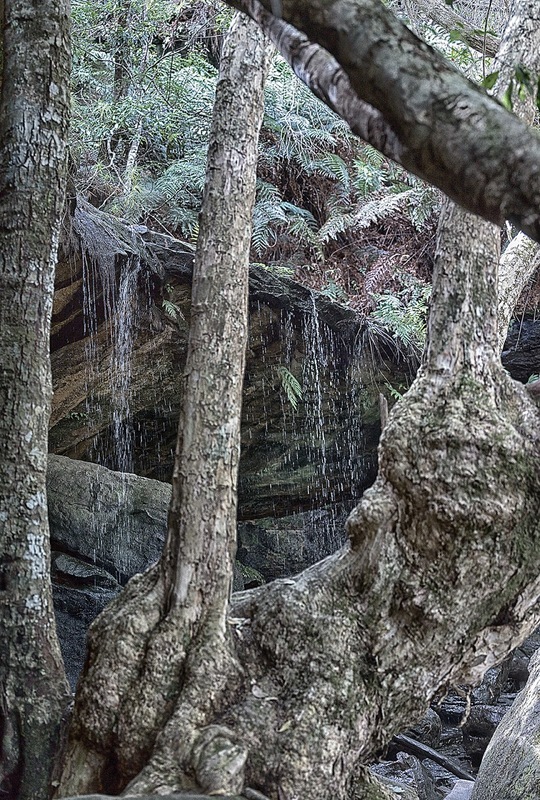 At the base of the first plunge, a tree has joined the volcanic base to hold the fall tight. 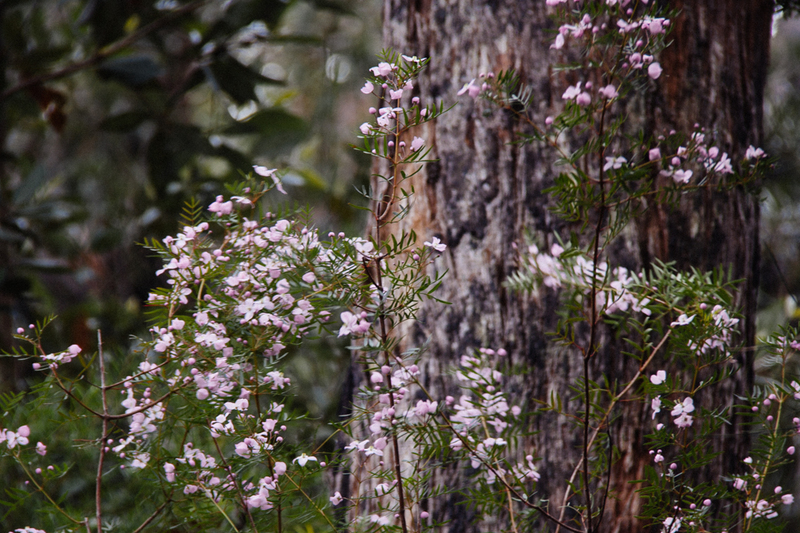 The embrace of the tree can only be seen when the fall is dreaming - at the end of a dry season such as we have had this year. 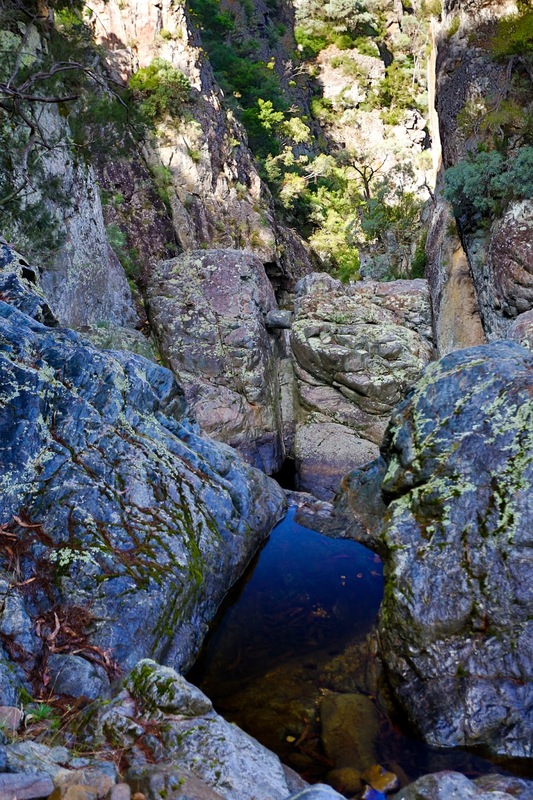 The ravine was well known in previous times. 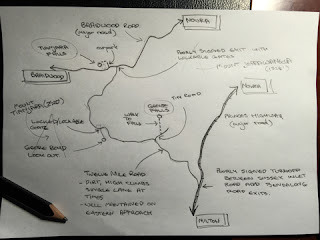 The First People feasted on the wild foods in the semi tropic and dry rain forests of the ravine. 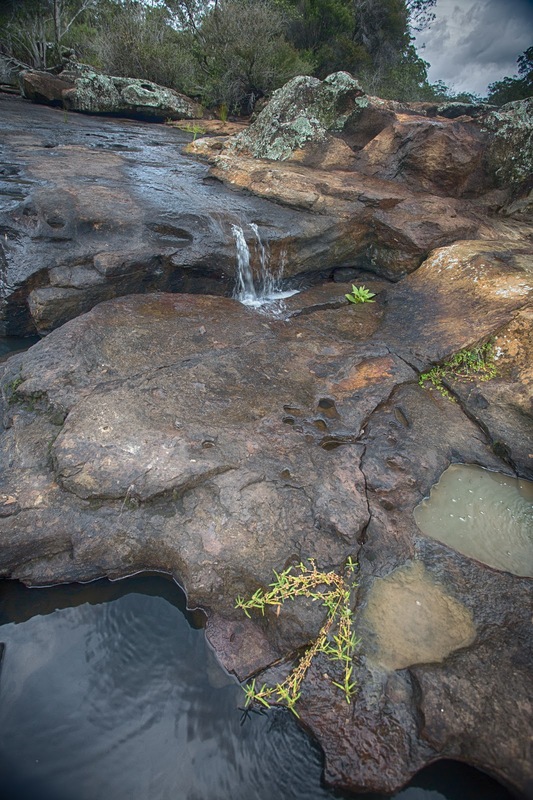 Colonials came to variously marvel at the falls and take advantage of the water left in old deep plunge pools. Briefly, one of the first settlers, Captain Sheaffe, met with the elders of the First People, and came away with two gifts. 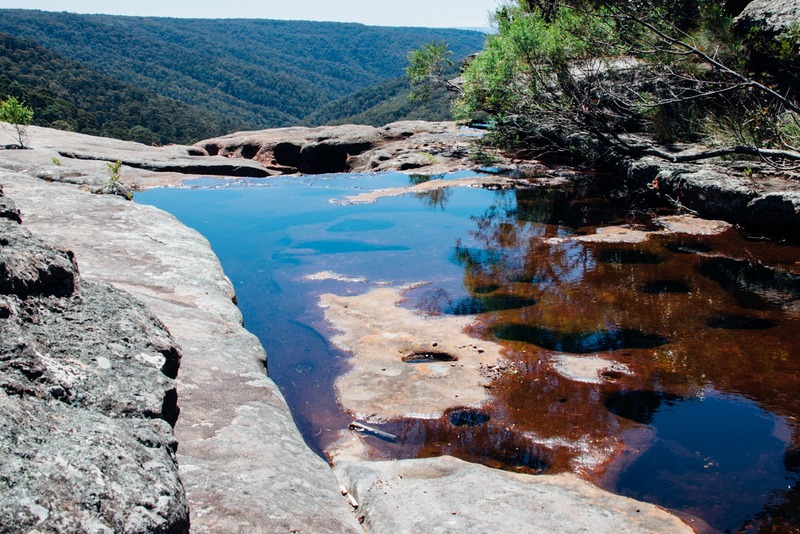 Firstly, he was given the name of the pools in the ravine - which he pronounced "Yatta YAT - tah". 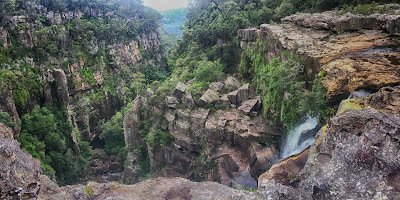 Secondly, he was given the love of this place, it's falls, fauna and flora, which remained with him until he and a friend, M'Lean, organized the gifting of the ravine to the people of the district. Today, memory of the falls is slowly fading, as the administering authorities quietly let the area fade into obscurity. 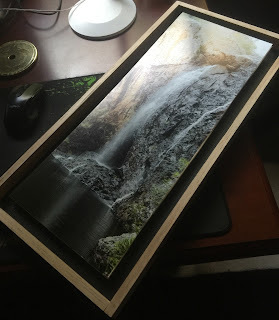 The falls have disappeared off official maps - a different sort of dreaming. 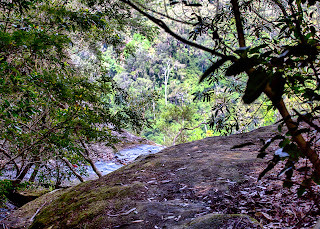 Fitzroy Falls: The tracks to all the falls start at the entrance to the falls reserve. 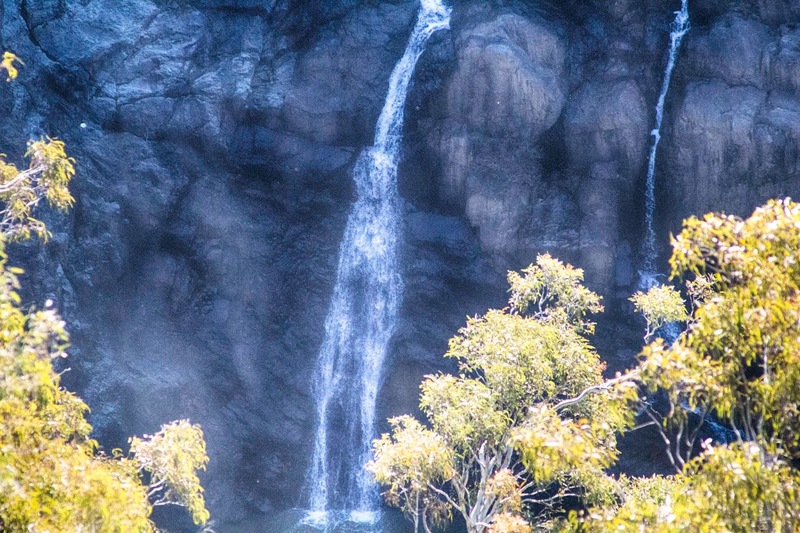 It is possible to drive to near Twin Falls, but this is not advisable until you have become experienced in the area. 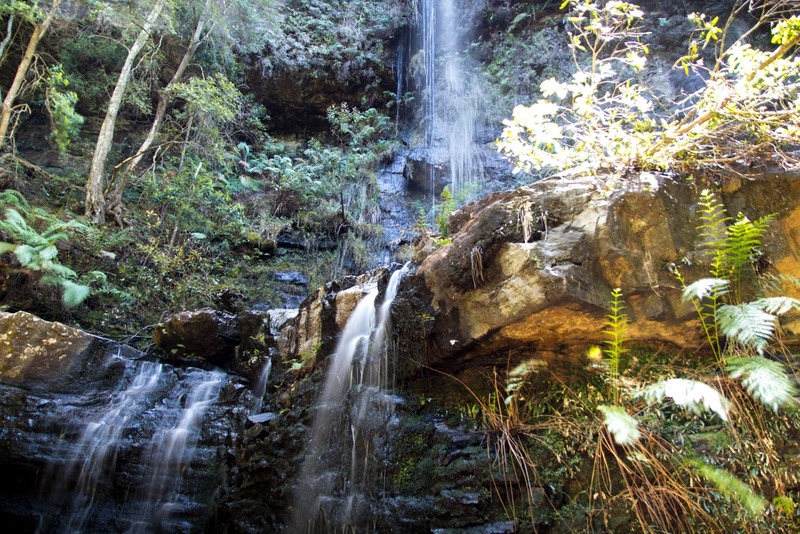 Carrington Falls & Nellies Glen: Budderoo National Park, access by travelling along the Jamberoo Mountain Road from Robertson or Jamberoo. 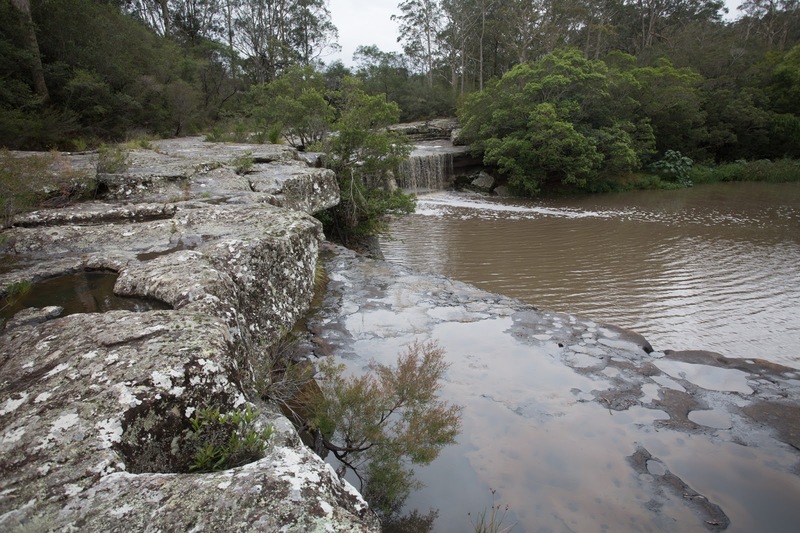 Turn onto the unsealed Cloonty Road at the Carrington Falls sign and follow for about 2km. Warning: watch the road signage carefully, as some online maps may take you to the wrong location. 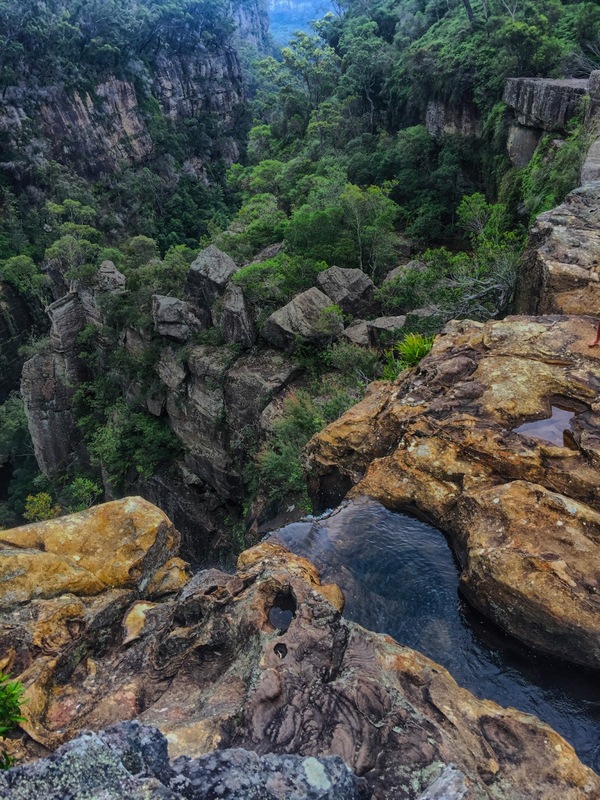 The raw beauty of locations like this is captured beautifully by you. Thank you for sharing with us. Al ChrisThanks:) I often struggle with what it is i see in these places. I am usually still in bush land when i first perceive a fall, perhaps the sound of the rush of water. This creates relief (that it is running) and expectation - and all subsequent observations are influenced by the spike in mood.